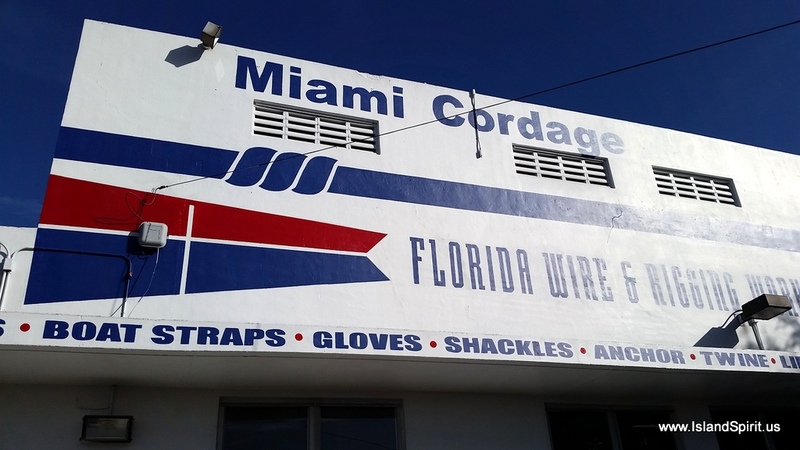 …Miami Cordage is THE place.. 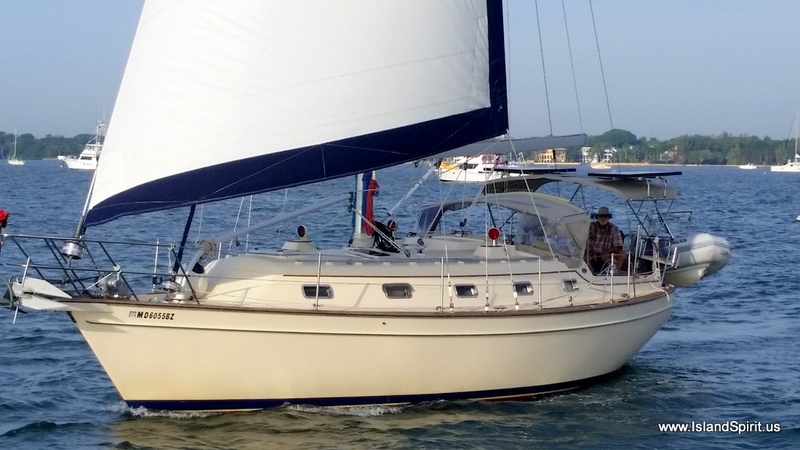 Team Island Spirit, along with IP 380 Plan Sea team Loretta and Jim and IP 380 Tamarak Bill, loaded of 250 feet of new 5/16″ G4 HT Acco USA made anchor chain. 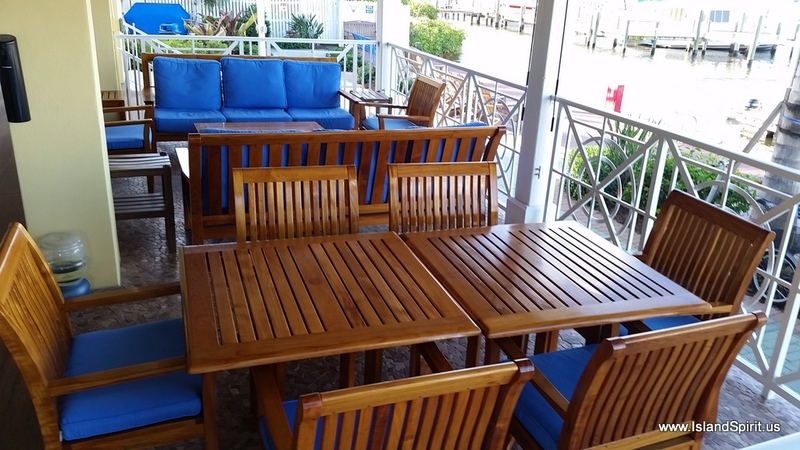 We found our best pricing from Stuart to here at Miami Cordage via the friendly and helpful owner named Jason. Using our $9.99/day Enterprise rental car we drove the 20 minutes north on I-95 and picked up the chain in the trunk of the car. 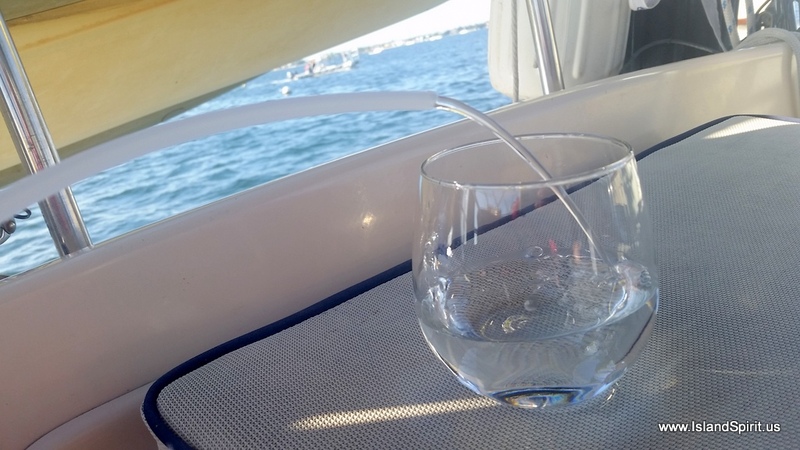 While there, we discovered that they also sell stainless steel ratchets that we use to secure the dinghy in the davits. We have never had SS ones, we always bought the cheap $20 ones from Home Depot and they would only last about a year. These are 1 1/2″ wide, beautifully made by Suncor, cost $75 and should last many years. 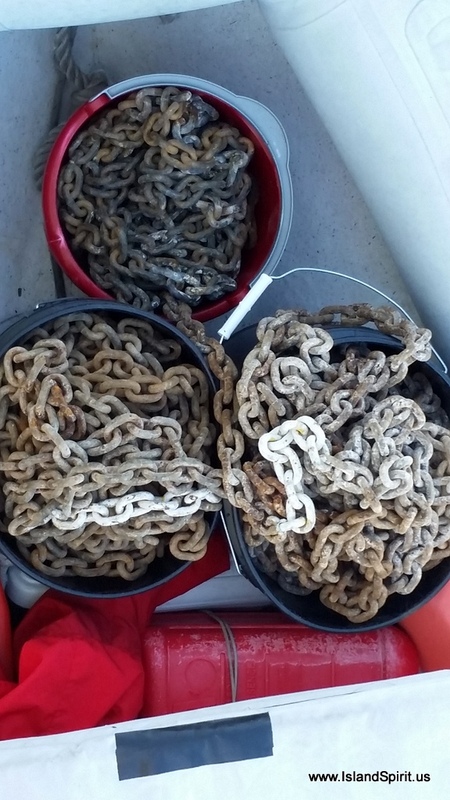 With our order complete, they cut our chain and asked if we wanted it in buckets. “OK” we said, wondering how we would lift a 125 lb bucket. They lifted both buckets at the same time with a fork lift. It was really cool how they did that from the loading dock and down into our trunk. These guys are pros and so pleasant to work with. Of course, on the way back to Dinner Key, we took a wrong exit off I-95 and ended up in downtown Miami. There we hit the brakes too hard and the chain buckets fell over and all the chain pushed into the back seats. Oh well, it is a rental 🙂 …. 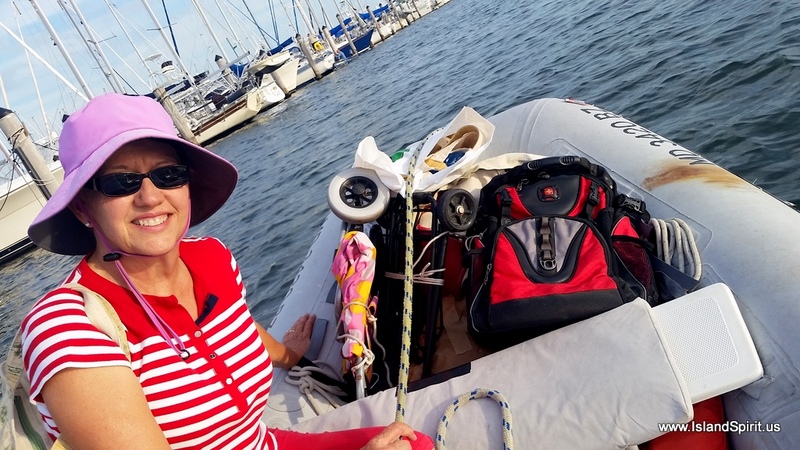 Once back at Dinner Key, we arrived precisely at high tide as planned to load the chain out of the trunk and into the bow of the dinghy. At 250 lbs, it made the dinghy bow go down, but it was no more weight than one or two people, so the 10 foot AB dinghy handled this easily. 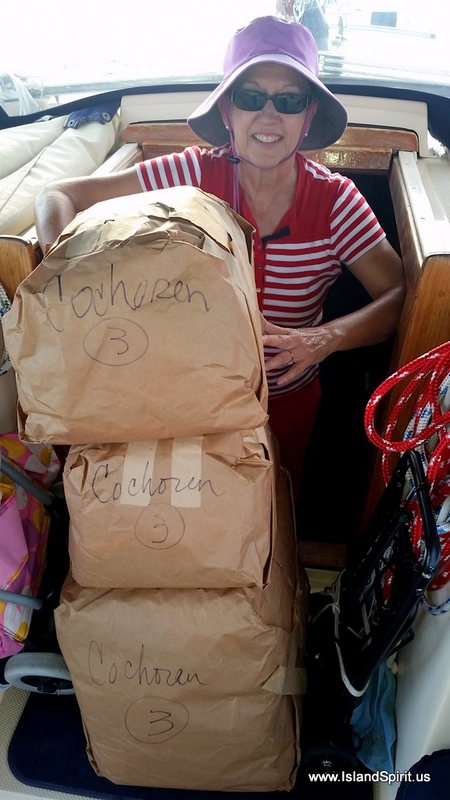 Thanks to our “Chain Gang” of Bill, Jim, Loretta and Radeen, we had this loaded and out to the boat in a very short time. 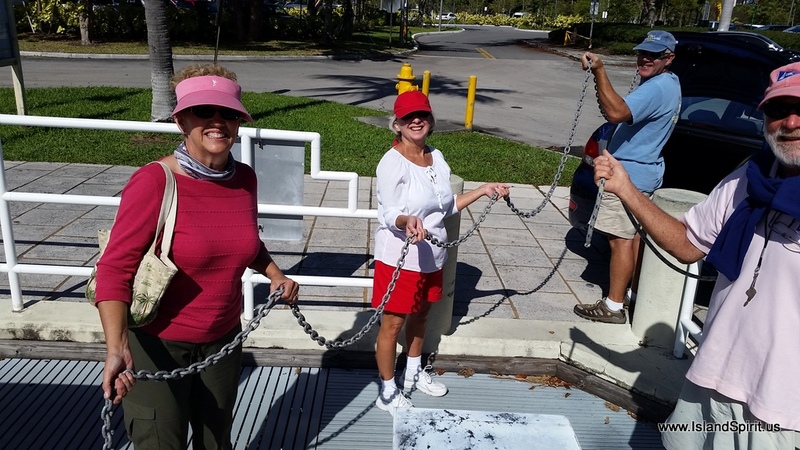 Jim then helped us offload the old chain out of the boat locker and down into the buckets in the dinghy. We are offering this old chain at $1/ft to other cruisers, cutting off whatever they want. I already sold 100 feet to one boater. 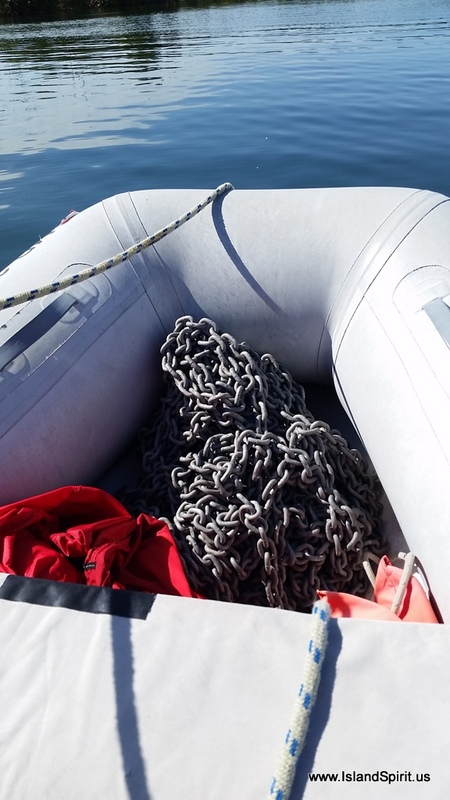 The reason we replaced the chain is that it was bought in 2002 and we are sailing onward to the Caribbean Sea for the next 5 years, so we wanted to go with new chain and a new shackle. 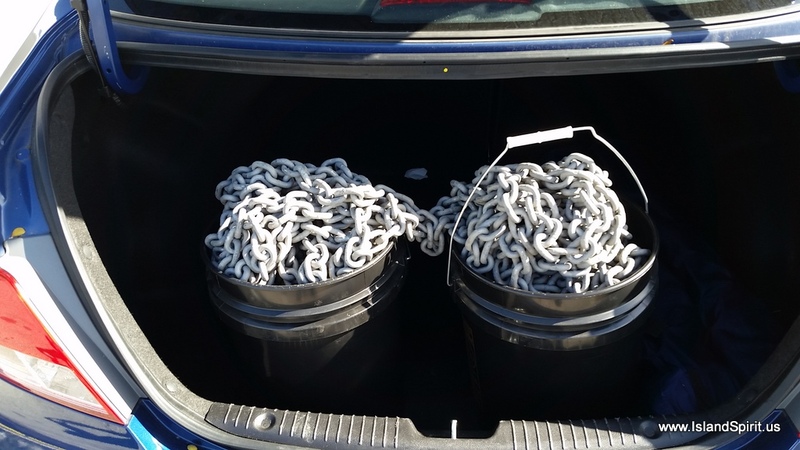 Note: 5/16″ G4 HT chain has a 3,900 lb working load and we use the USA made Crosby HT 3/8″ shackle which has a 2t WLL or 2 tons working live load. 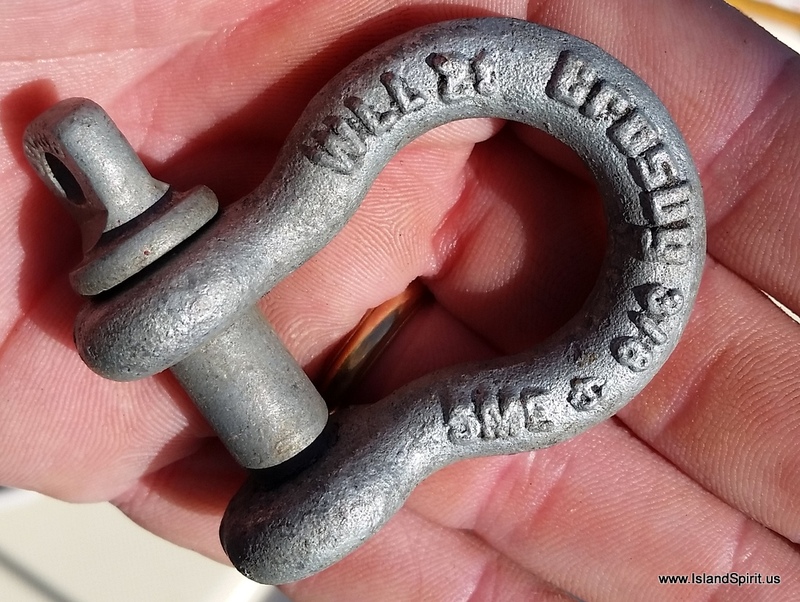 Many people put the wrong shackle on their HT chain and that becomes the weakest point. 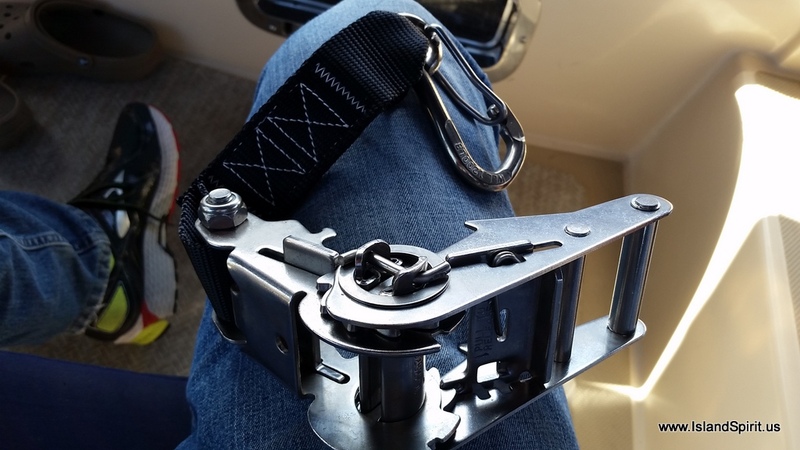 We also do not use a swivel because we have a horizontal windlass and the chain does not get turned or twisted very much. 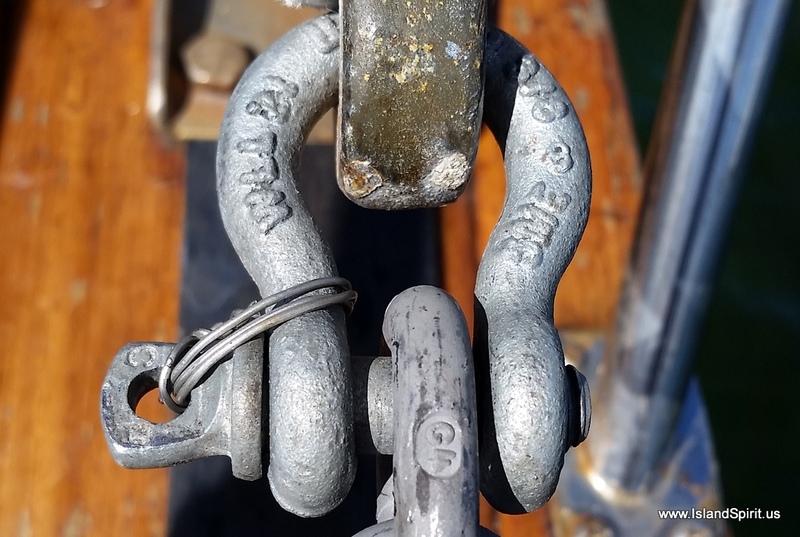 So, our new anchor chain is on and we have one more boat job to do and that is to tune the standing rigging and tighten the forestays. After a trip to Costco today, then it will be a waiting game for a weather window. USA Crosby 2T HT shackle. The proper one. USA made. 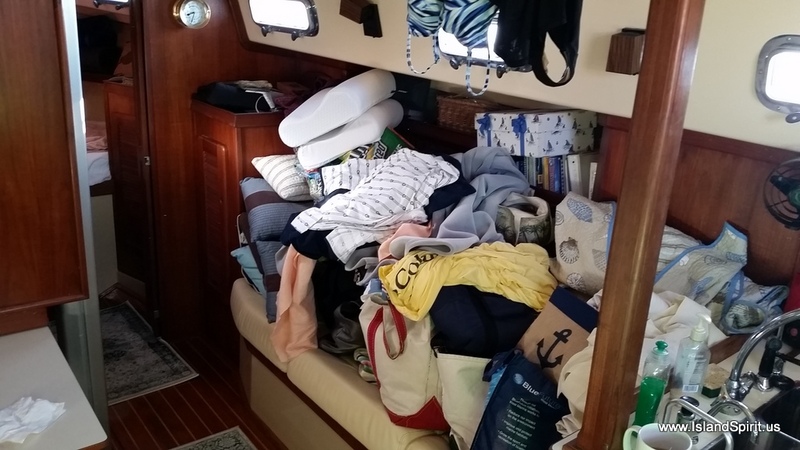 This should just about do it for the refit of Island Spirit, new sails, new electronics, new running rigging, new Spectra watermaker, and new anchor chain. Now if the east winds will just stop blowing we can head out. 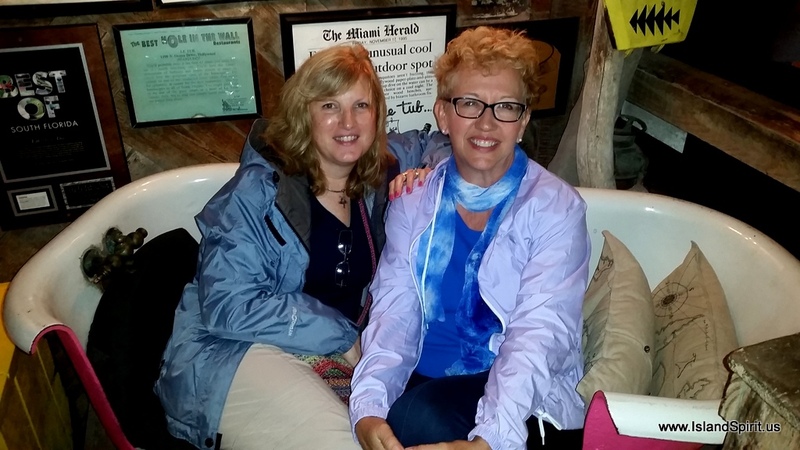 Looks like next week now…..
Every time we have sailed to the Bahamas, now this the 6th year, we have left from Miami. Why would we stage here, people ask? The bottom line is because it is easy and close. 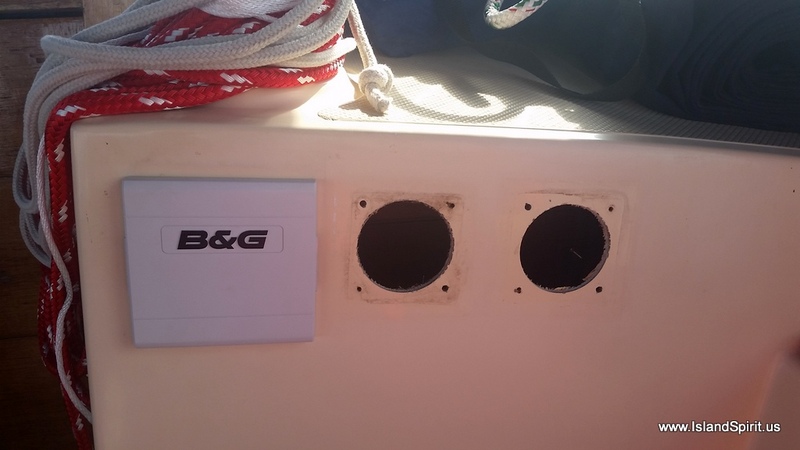 There are plenty of anchorages for waiting for weather and there are grocery stores, hardware stores, car rentals, pubs, gas docks, water docks, dinghy docks, all to support our preparation to sail out to the the Bahamas. 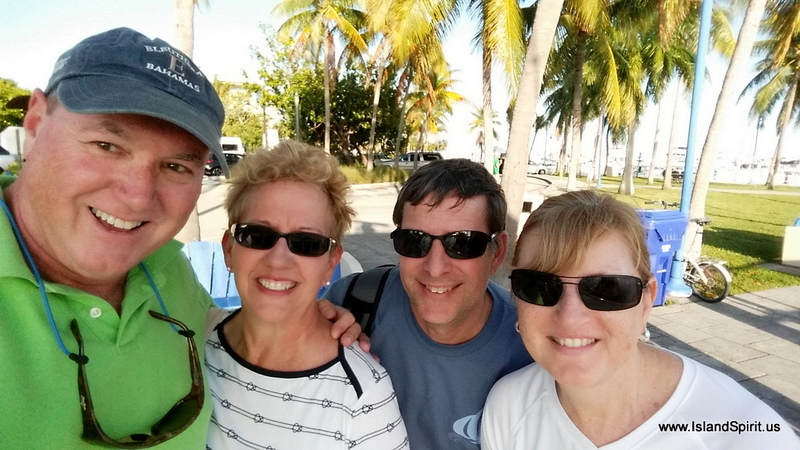 Every year, we bump into friends at the Coconut Grove Sailing Club and others who are also preparing to leave. This is a great place to stage up and get ready to sail out. 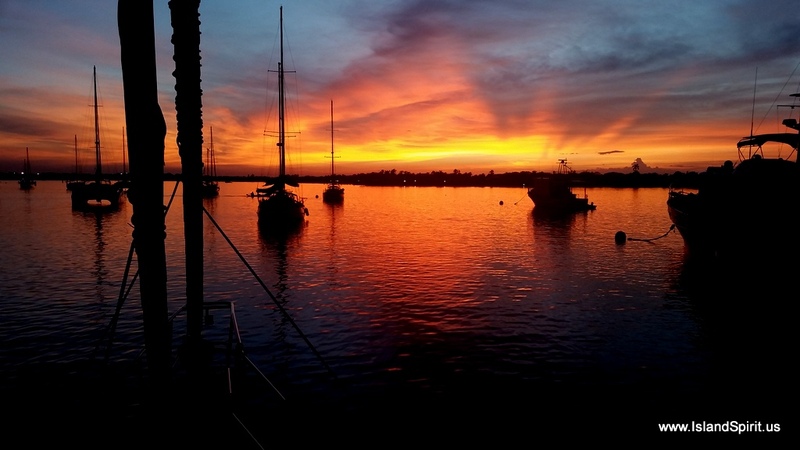 Every thing you need is is within an easy walk of this harbor, and we love it here. 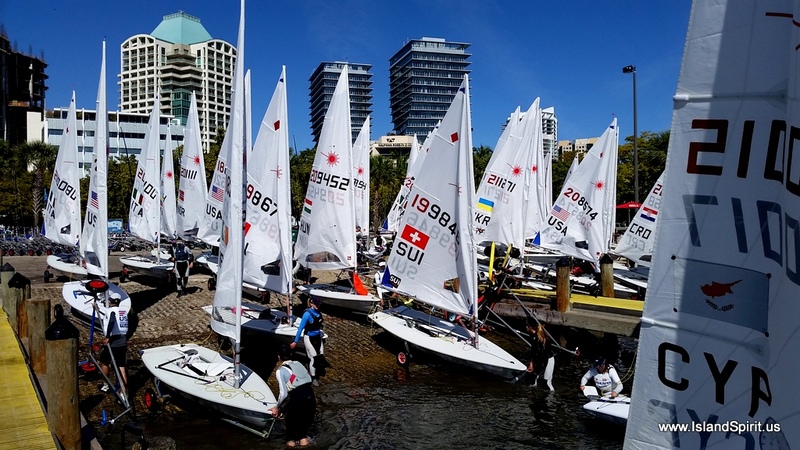 Add to this, the end of January is always the World Cup Sailing Event where the best of the best from all over the world come to Miami to compete. 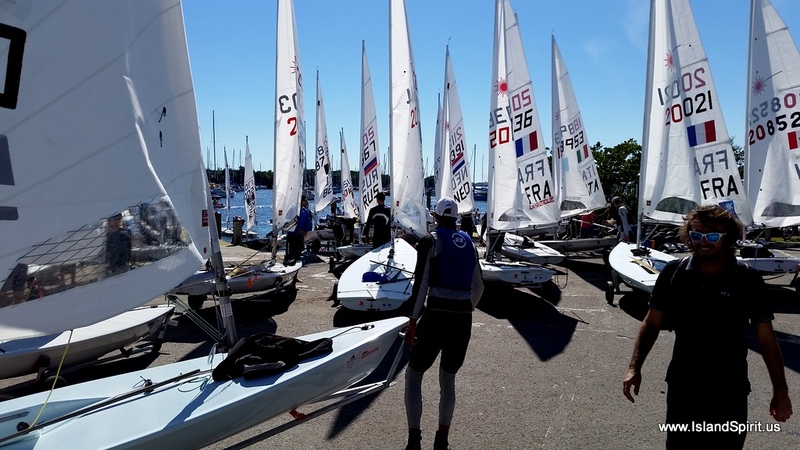 Many times these races are qualifying races for the Olympics, so it is great meet and watch these world class sailors. 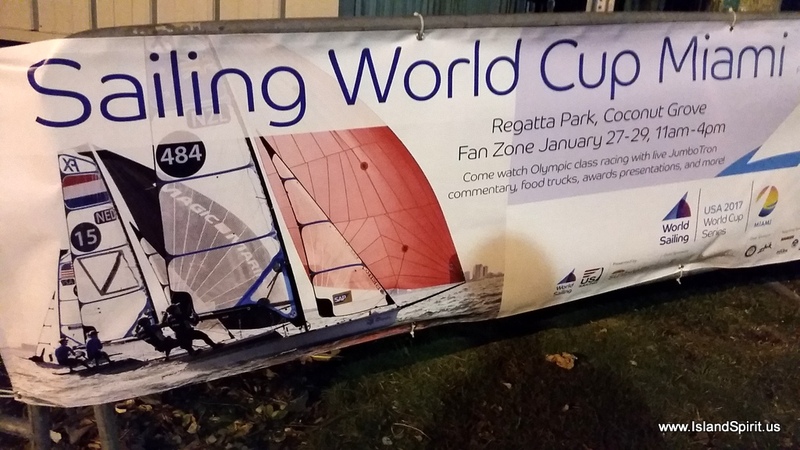 This is a sailing event like no other. Well, we have a punch list of final jobs and it always seems to be the same. Firs,t buy up all the food and booze we think we will need for the next 3-4 months. Fix the last items on the boat like: 1. replace the impeller. 2. tune the rigging. 3. fuel up and fill 4 diesel jugs and tie these on deck. 4. Watch the weather and be ready to sail out on any day the weather is good. 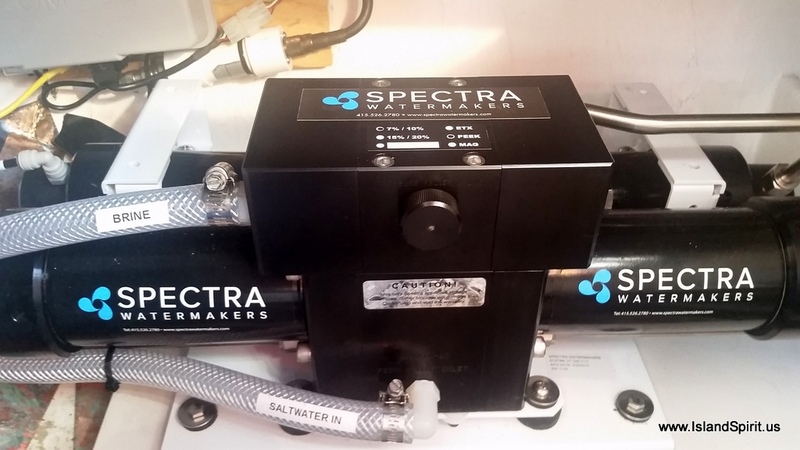 We also fired up the Spectra Ventura 200t Watermaker and turned salty Biscayne Bay water into pure drinking water. It is amazing how easy this machine is to run. 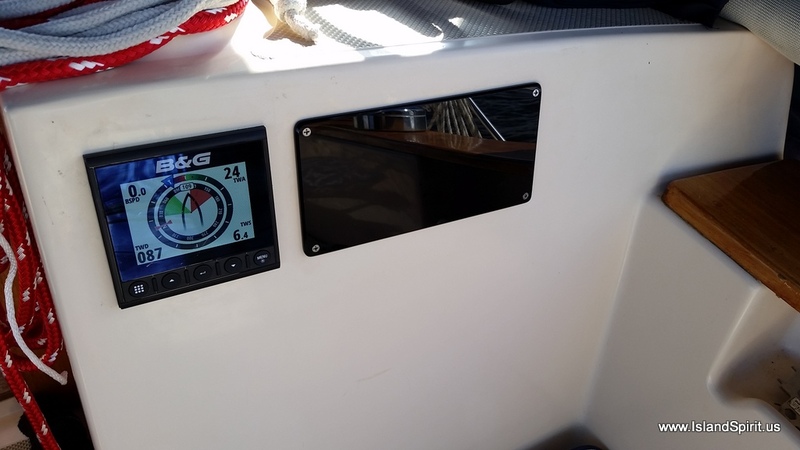 Simply open the seawater intake, turn on the feed pump, dial up the pressure and out comes fresh drinking water while only using 8 amps of 12 volt power. WOW, that is really amazing. Yes, it is low production at 8 gallons per hours but then again we are running this off wind and solar power which is really cool. We plan to run the watermaker every day during mid day when we have extra solar power. If this all works as planned, then we can keep our water tank full via wind and solar, using about 7-10 gallons of water a day. 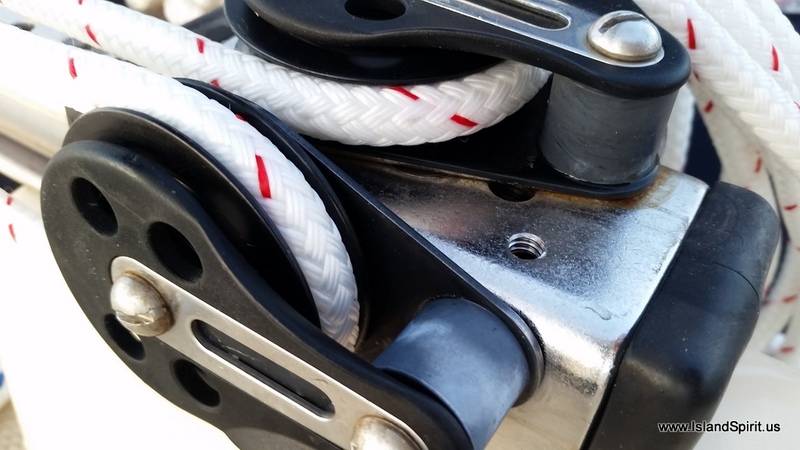 Added to these common prep tasks, we have decided to replace our 250 feet of 5/16″ G4 HT USA ACCO anchor chain which is 16 years old. We beat it to death last year during a bad night on the Bahama Banks. 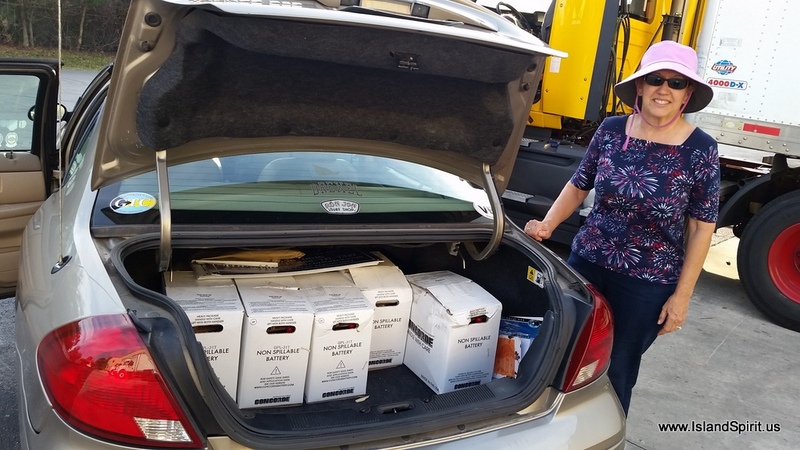 So, we will use the rental car to load 250 pounds into the trunk. Then we will take it to the dinghy dock and haul it into the bow of our 10 foot AB dinghy. We will take it out to our boat, load it up and onto the deck via the windlass. Then we will offload the old 250 feet of old chain. This will be the final refit job of 2016-17 for Island Spirit. 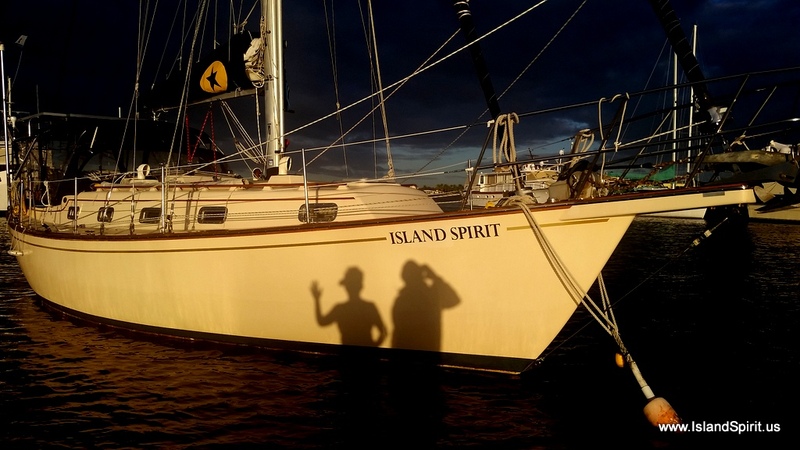 Island Spirit is almost like new and she is ready for a new Caribbean adventure. We are excited and we are ready to get sailing. We should be after nearly 3 months of refit work! 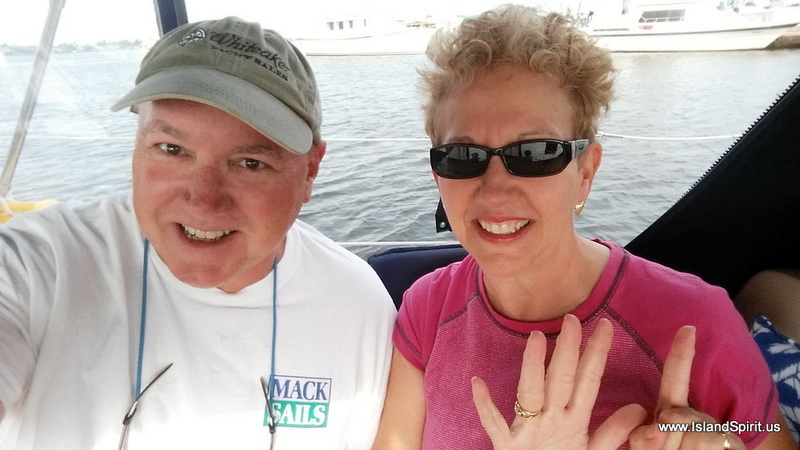 Longtime great friends, Fred and Gail, made the effort to fly from Philly to Miami and join Team Island Spirit for a 5 day visit filled with laughs, fun and sailing adventures. 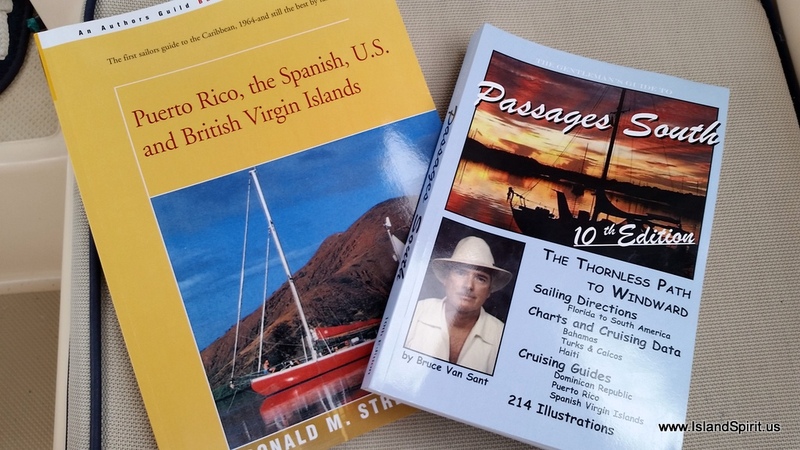 We have been sailing together since the early 80’s and have taken several Caribbean sailing charter vacations together. 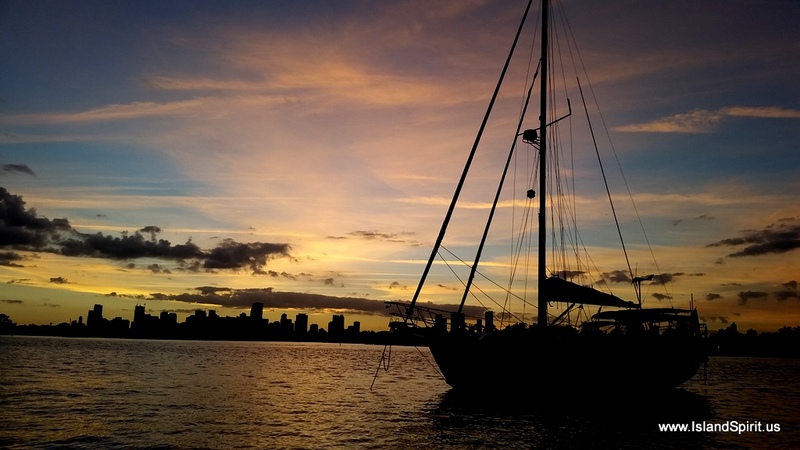 With winter weather up north and with Island Spirit just arriving Miami, this was a perfect time to jump on board. 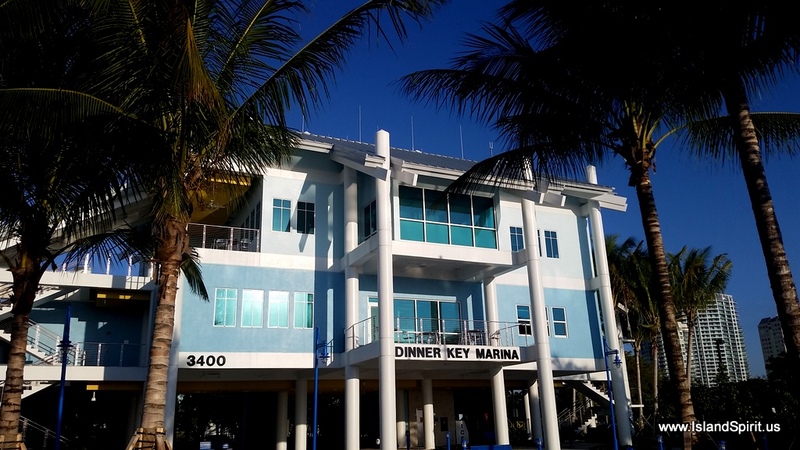 We docked the boat at Dinner Key Marina for a late Friday night arrival, where we stayed up until midnight catching up. Then after a Sat morning walk around Dinner Key and the Grove, we departed for a day of sailing on Biscayne Bay in a perfect 15 knots of south wind. When the winds go south from a normal east wind, then a new front is coming and the weather can become serious. We had been timing the arrival of this cold front which was forecast to be very strong, with winds of 30 to 40 knots from the west for Sun night and and Monday. 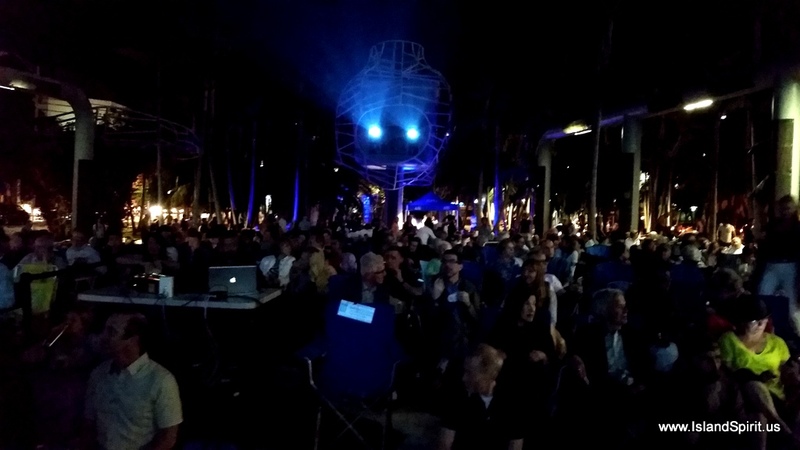 This south wind and building southwest wind prevented us from sailing back to Miami Sunday a.m. from South Beach, where we really enjoyed the New World Symphony Wallcast. So, with this strong cold front arriving Sunday afternoon, we decided to run 15 nm north back up the waterway to the town of Hollywood, FL. Here we secured a dock for Sunday and Monday, keeping the boat safe, but more importantly, allowing us to get off the boat and walk to a very cool beachfront town. 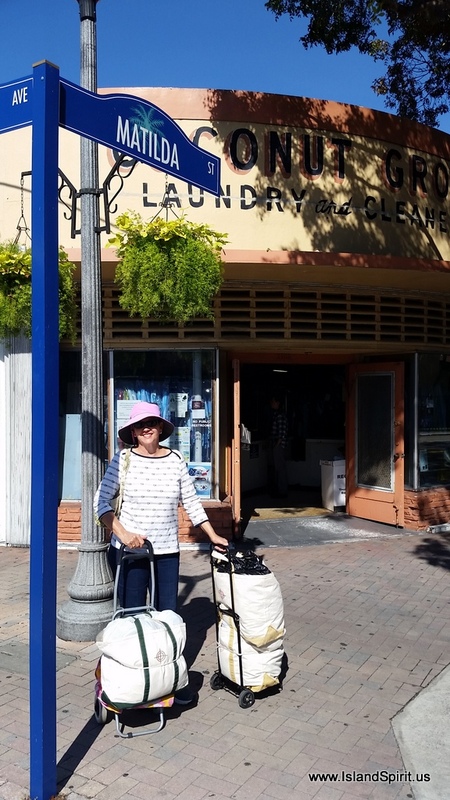 Once secured in Hollywood City Marina, we immediately walked east over the bridge and two blocks to the beach. This beach town is very nice with pavers for the boardwalk right on the sand level. Every day we would walk over to the beach in the late morning and then walk back to the boat for lunch and then walk back to the beach for an afternoon swim. 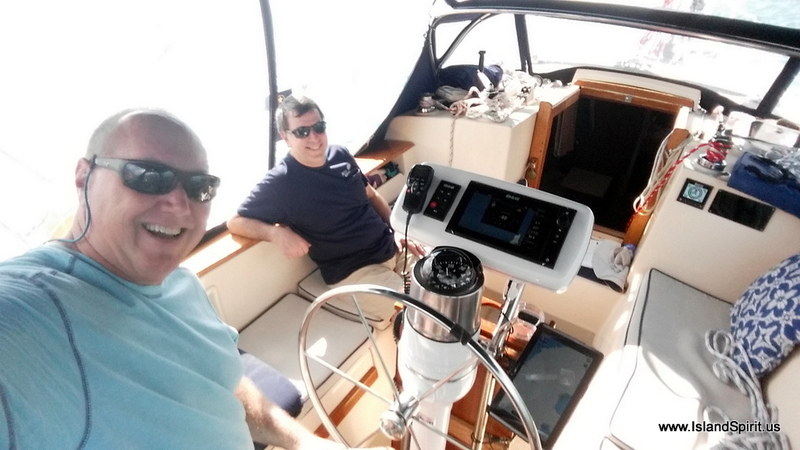 This was a great way to spend our time while the front arrived and blew 30 knots. 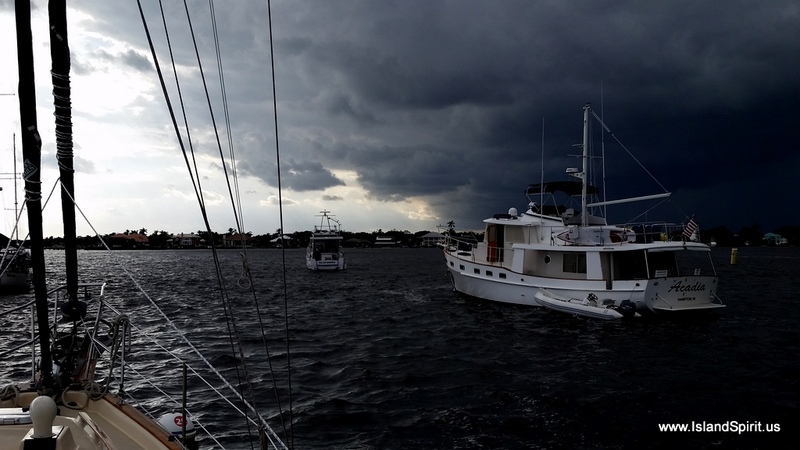 Over night when the front hit, we had thunder, lightening, downpours, and gusts to 40 knots. 12 miles away, a tornado struck with winds of 175 mph in Hialeah, Florida where many buildings were damaged. 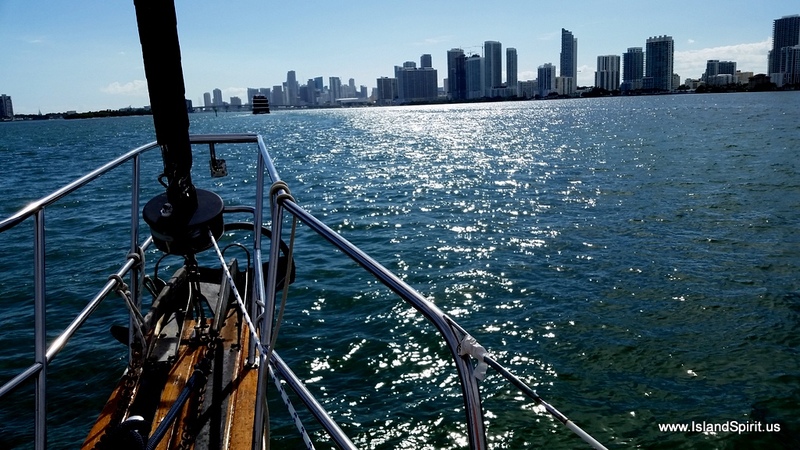 By Tuesday, the front had passed and we headed 15 nm back down the waterway through the city of Miami and back to the beauty of Biscayne Bay. 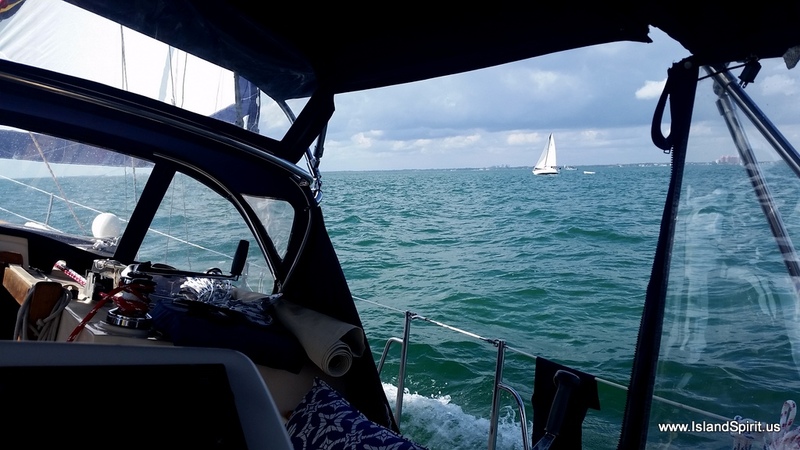 There we set full sail with main, jib and staysail in 15 knots of WEST winds once again. 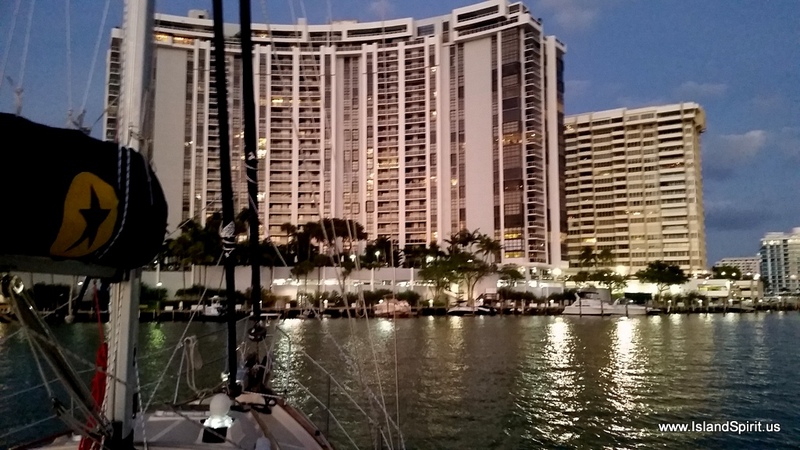 Sailing Biscayne Bay is always a joy because the winds are usually 10-15 and the waves are usually 1 foot or less. Team Island Spirit won our first race of the 2017 racing season as we sailed close hauled next to an S2 who first crossed our bow and then we tacked behind and climbed windward of him and passed him. Fred and Hayden love to trim sails as we used to race together on a J-35 on Long Island Sound for about 7 years. 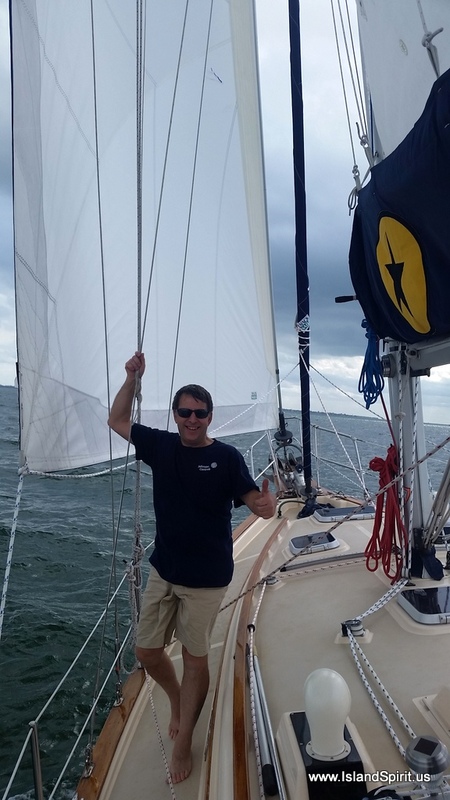 Team Island Spirit was locked on autopilot wind vane steering and we simply sat back and watched her sail up and over this S2 who had a 135 jib against our 110 Mack Sail. 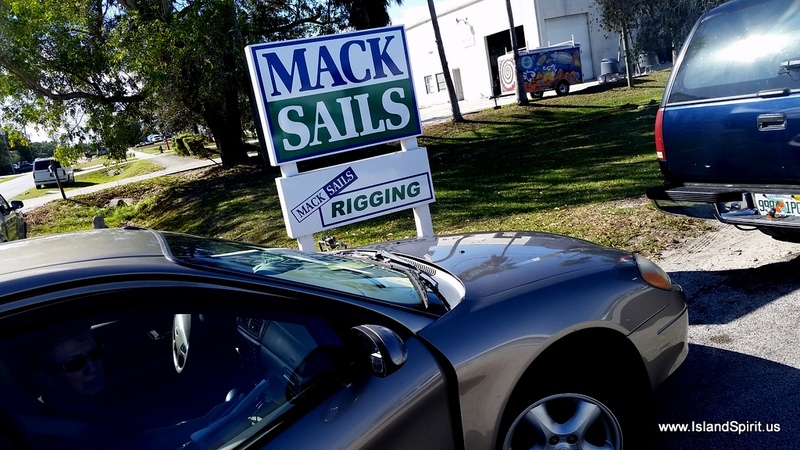 We love our New Mack Sails, they look GREAT! Here are two maps of our adventures. First, an overview of Fred and Gail arriving in MIA, then taking a car to Dinner Key Marina, then up to South Beach, then north to Hollywood, then south to Biscayne Bay. The next map shows us sailing up, down, across the the Bay, then back to Dinner Key where we dropped the hook and where I am writing this blog entry. The overview of where we went and how the 30+ knots of winds arrived. 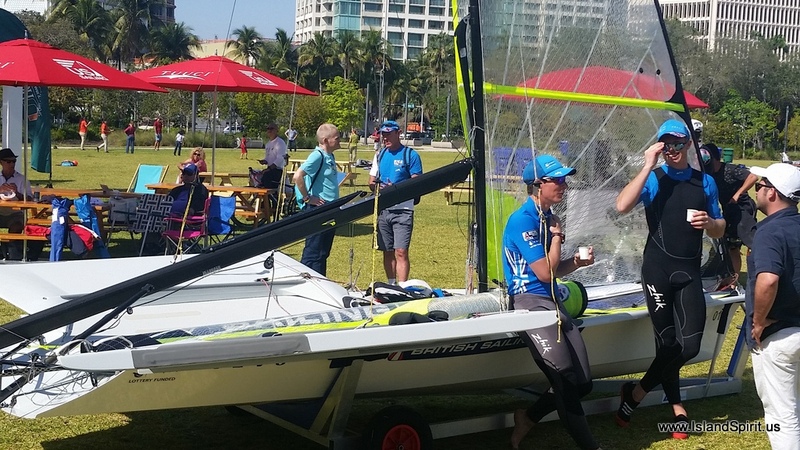 Now, to top off the visit, Fred and Gail were lucky enough to be here for the Miami World Cup Sailing Event where the best of the best from all over the world meet in Miami to determine Olympic qualifiers. We have Lasers, 420s, Finns and 49ers. As luck would have it, as we sailed back north on Tuesday we were able to place Island Spirit directly on the starting line for the Laser start. We counted 80+ boats. Freddie being a race committee chairman of many races took the helm and expertly drove Island Spirit around to the pin end, one boat length off the start at exactly the starting gun. Then we motored up the course along with these world class sailors right up to the weather mark. Next, we stood off the weather mark and watched as the leaders rounder the mark. Amazing way to watch the race. Fred knew exactly where to position Island Spirit as to stay out of the way, but yet be right next to the racers. Photo Boy got these great shots…. 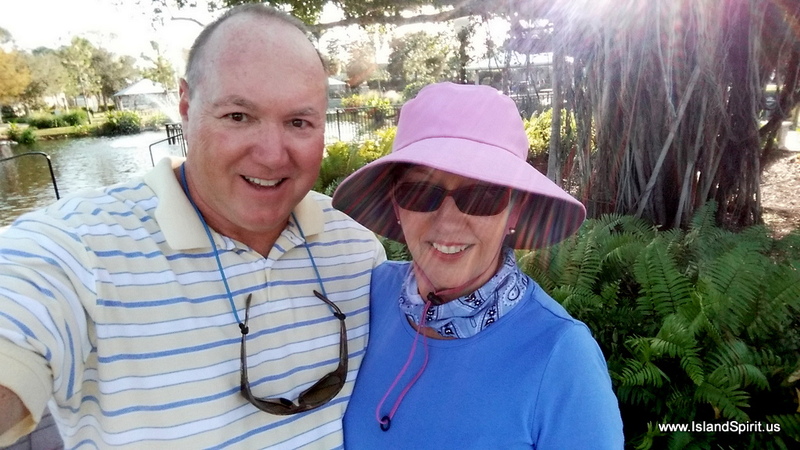 After chasing the World Cup sailing around the bay, we had to return to Dinner Key area, and drop an anchor because, sadly, it was time for Fred and Gail to return to the cold, cold north. 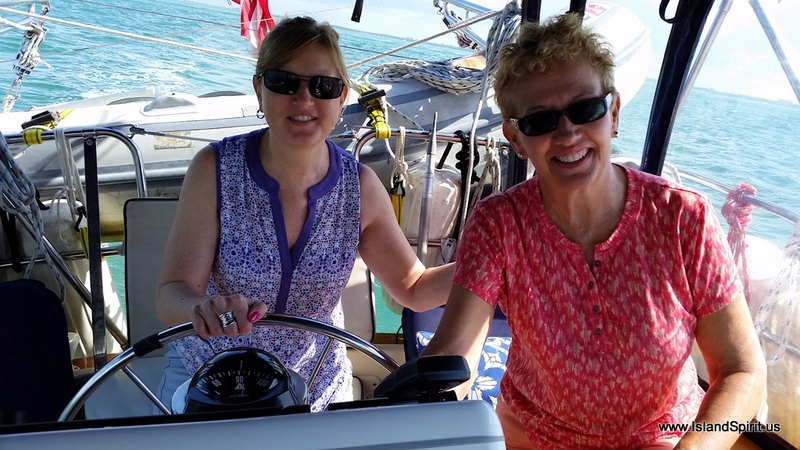 So we dropped an anchor off all the moorings, about a mile offshore of Dinner Key, and we loaded up into the 10 foot AB dinghy and splashed our way into shore. 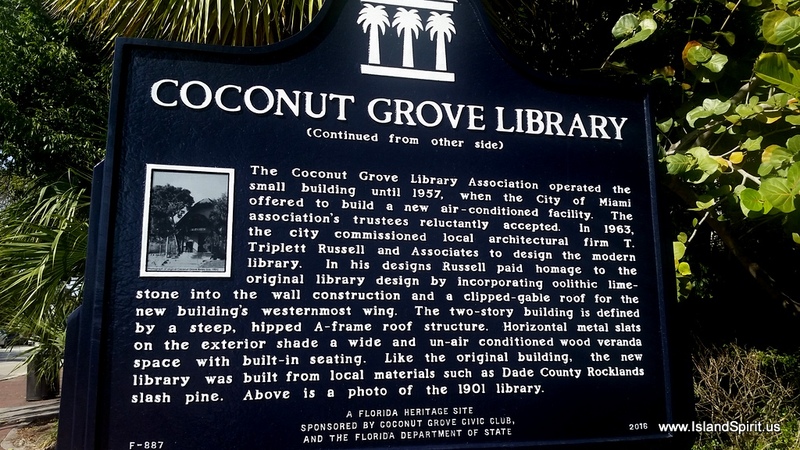 There we dropped off their bags at the marina and then headed up into “The Grove” Coconut Grove where we walked the fun town and had dinner at the farm-to-table “LOKAL” resturant. Here we ordered alligator strips and great sandwiches. We walked back to Dinner Key to order an UBER and it was off to MIA for a flight back to Philly. This was a very fun visit and we packed in a lot of activities. Thank you Fred and Gail for coming down. It was really a great time! Here are the best few photos of the 350 I shot! 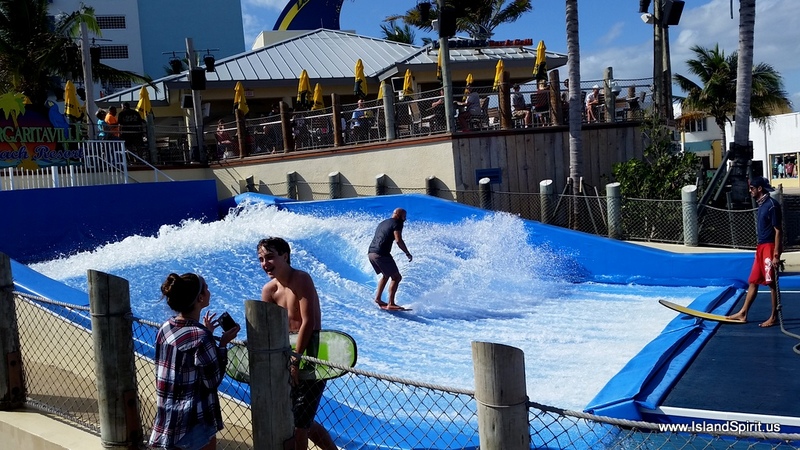 Did I say Wave Machine!? Surfs UP! 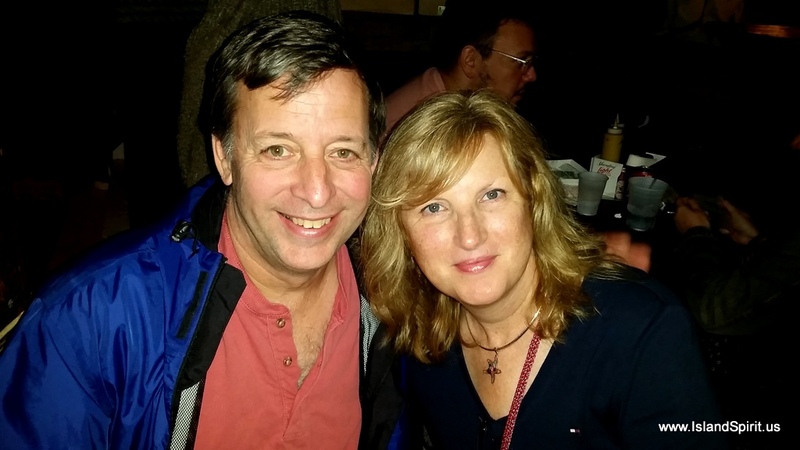 Thank you, Fred and Gail for a great night out at a fun place. 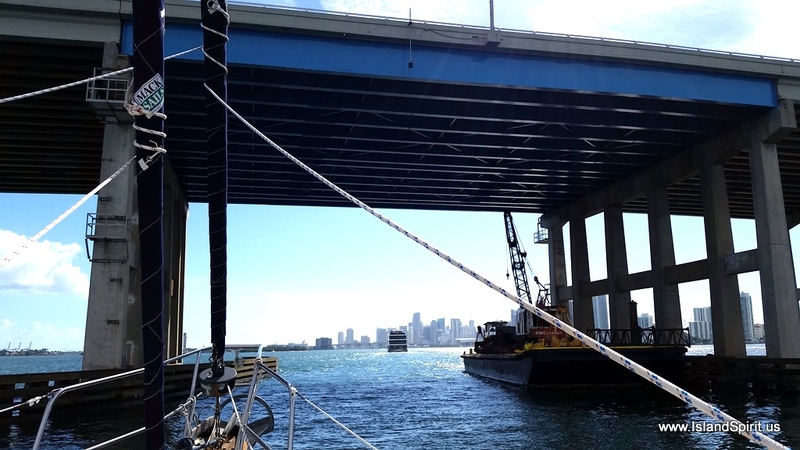 Heading into South Beach via the Collins Canal under the roadways. 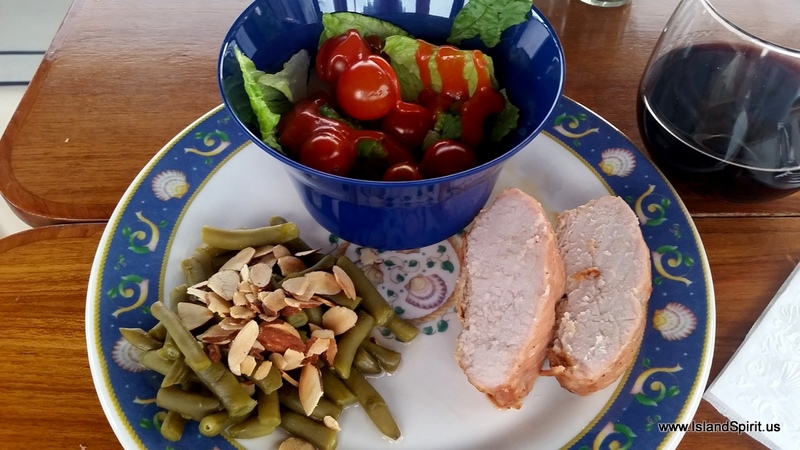 A fine dinner of Moroccan Chicken Stew by Radeen. 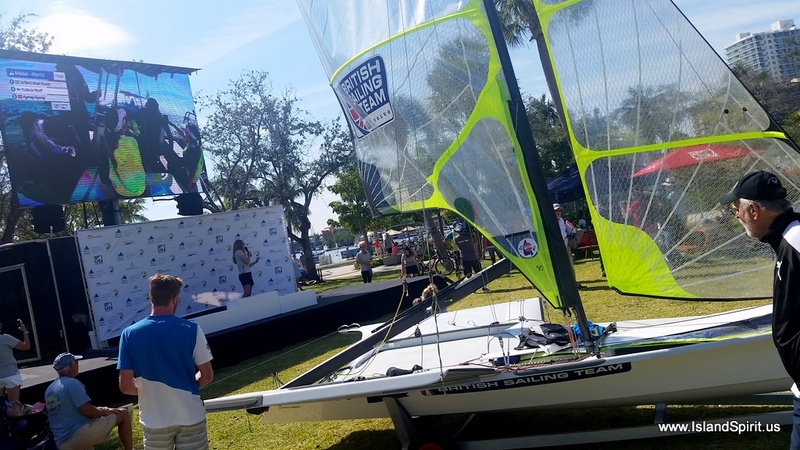 ZIP….there goes another 49er at 20 knots! And what would a trip on Biscayne Bay be without a view of Stiltsville? 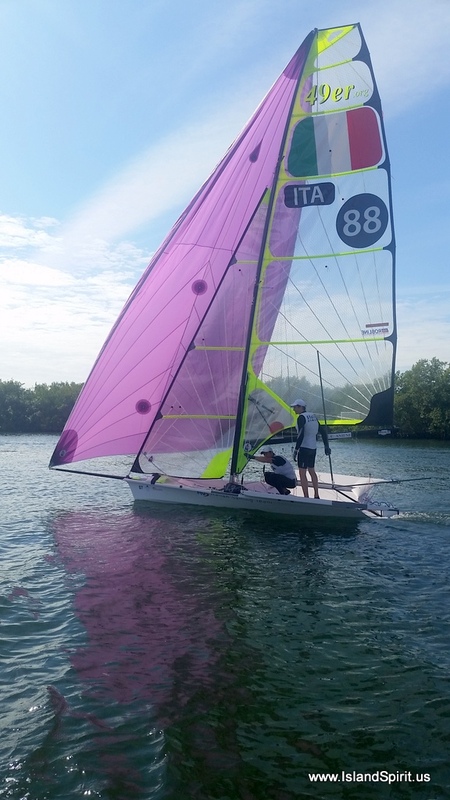 Yes, the WASZP sailboat can FLY, see this one up on foils…WHAT? 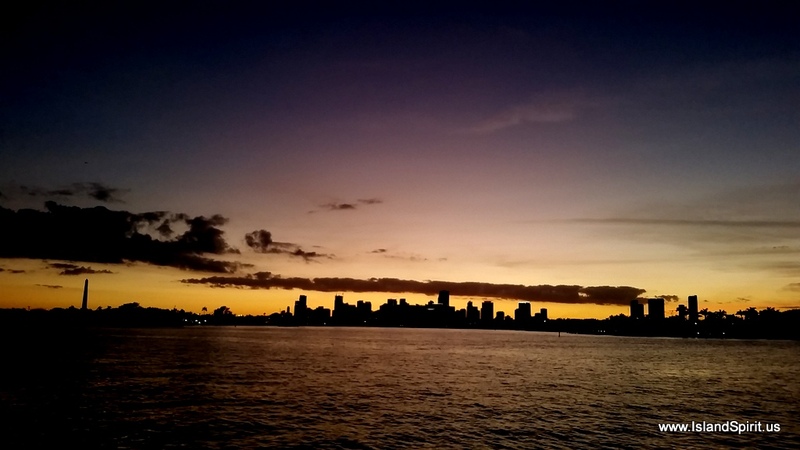 Biscayne Bay and Miami and Coconut Grove and Miami Beach and Biscayne Bay, all of this is a must see stop when sailing and cruising. We really enjoyed showing this to our good friends! We traveled through the mecca of world yachting today. Fort Lauderdale, and then onward south to Miami where we turned east at the Venetian Causeway West bridge to make a stop in South Beach (SoBe) known properly as Miami Beach. The photos we take in this section are always over the top when it comes to demonstrating wealth. The waterfront “winter” homes are even more massive than what is just north of here on yesterday’s leg. The yachts are the biggest anywhere in the world, and there are many of them. 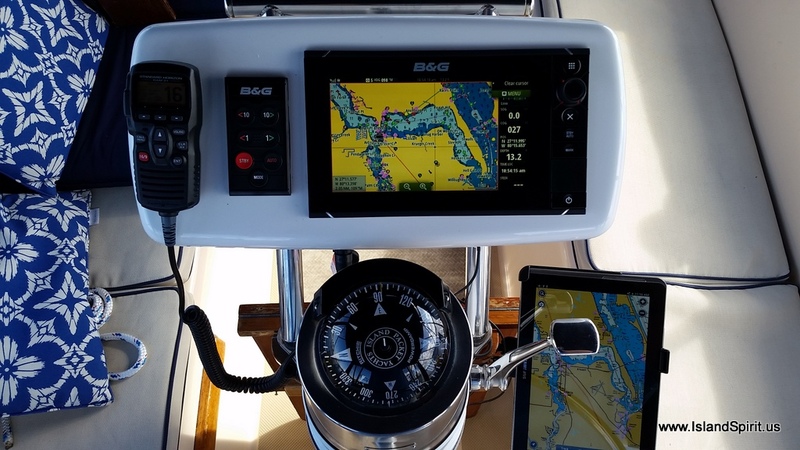 It is surprising to learn that having boat work done is not excessively expensive in Ft. Lauderdale, due to all the competition. 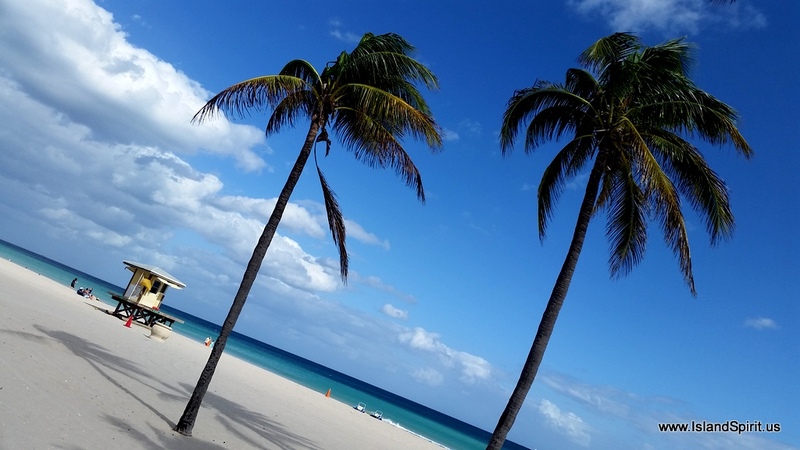 We have now made it to one of our “happy” places, that of Miami Beach, Florida. We are anchored out off Belle Island, as usual, and we take the dinghy into the Collins Canal and dock at the Publix’s Dock. Construction on the retaining walls is complete and the canal is open. 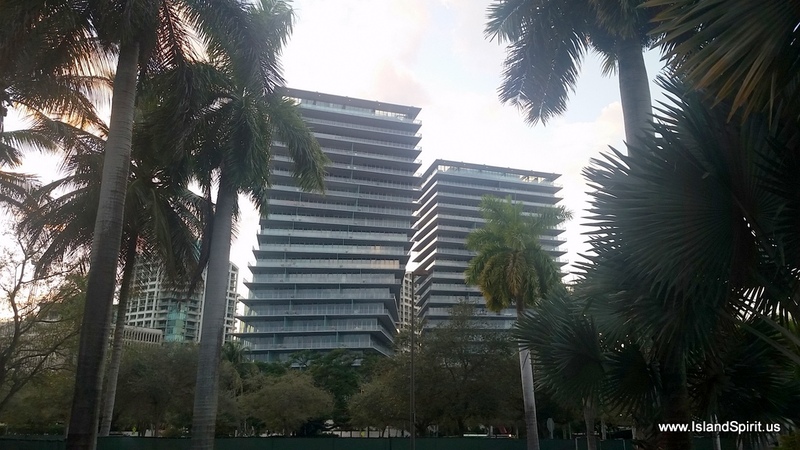 There we climb the tall dock and then onto the street and walk 1.5 miles into Lincoln Road. Here the street is closed off to traffic with coffee shops, ice cream, pizza shops, and everything that the international traveler needs like an Apple Store, a Garmin Store, and upscale clothing lines. It is a great place to walk and to enjoy the many sights and international languages. Lincoln Road leads over to Ocean Drive for a 3 mile walk along world famous South Beach. Several public parks, beach accesses, walking paths, the famous Art Deco buildings and many bars and restaurants are found along Ocean Drive. 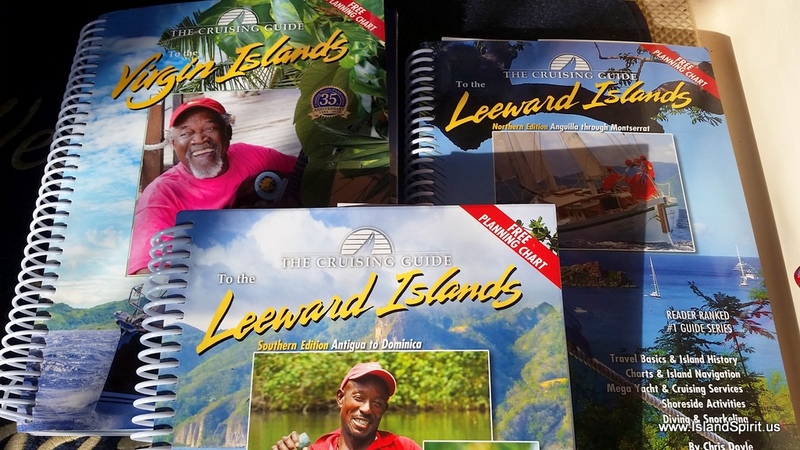 If you are a cruiser, then Belle Island is the place to drop the hook and explore this wonderful area. 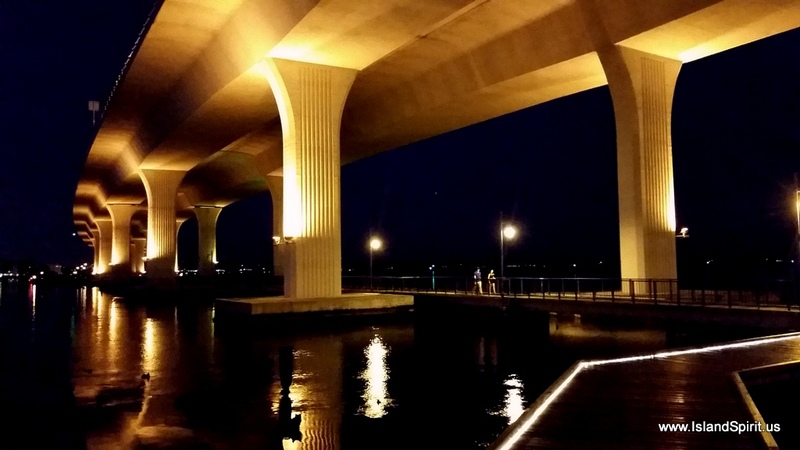 the Julia Tuttle Bridge. It is 56 feet, we are 49’6″. Taller vessels must go off shore between Miami and Ft. Lauderdale. There it is, our first view of the Miami skyline. These lift bridges are so interesting to transit. The centerpiece home in Ft. Lauderdale. The stern of this yacht opens to lift out the jet boats with a crane. The 50 foot tender has 4 outboards, this is 1,400 hp! The same yacht as seen from the bow, I am calling this 130+ feet long. That tender is at least 50 feet long. Here you see a person cleaning the windows on a smaller yacht. These guys give perspective to the size of the yacht. They are mounting railings on the 3rd floor. This one is my favorite, It is called Savanna. Well, it is everyone’s favorite…. This yacht has two staircases on the stern and is four stories tall! These are containers, they are tractor trailer boxes. You see them on the road all the time. Cruise ship getting washed. There was one guy power washing each balcony! Notice the specks high on both sides of the building, then look at next photo. Those specks are window washers rapelling off the roof! We like the palm trees on these roof top decks. This is how we get into South Beach, via our dinghy into a canal. Lincoln Road Plaza walking around. This is where the street used to be. 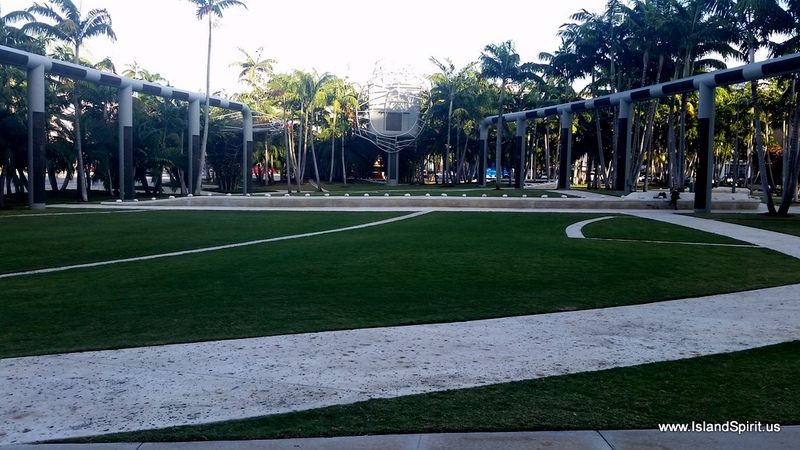 This is the park where hundreds of people will gather for the Wallcast concert. 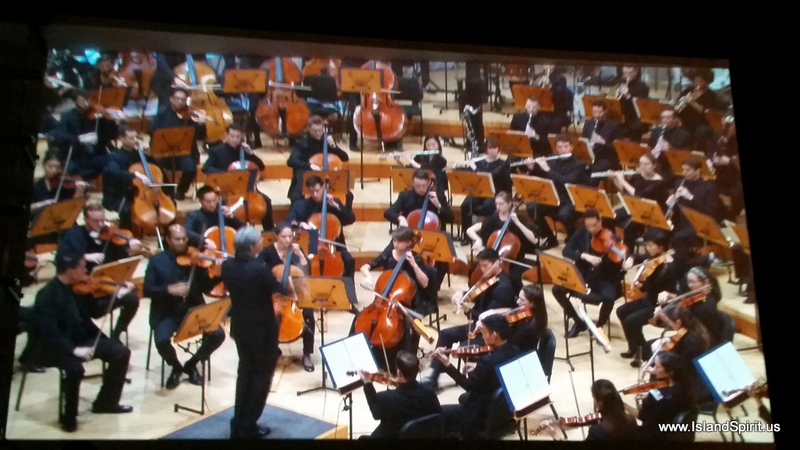 The projector in the middle and on the sides are speakers in tall tubes. I shot over 400 photos today. There are always so many great scenes to photograph. We never get tired of running this section of the waterway. 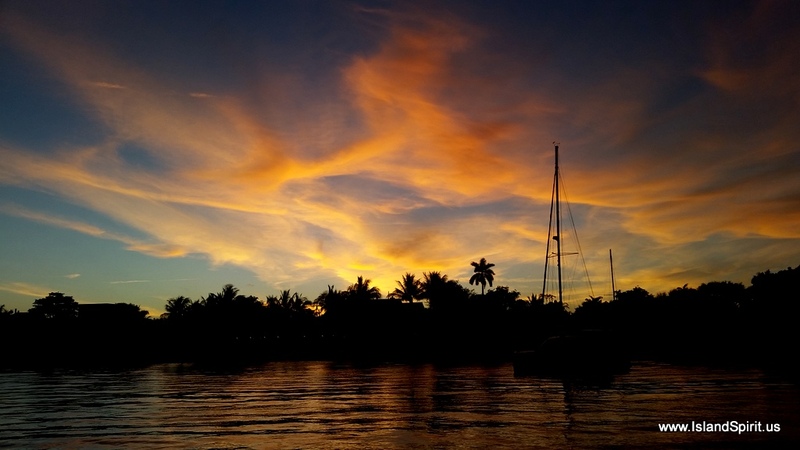 Biscayne Bay is just one more hour south to the best place for sailing. 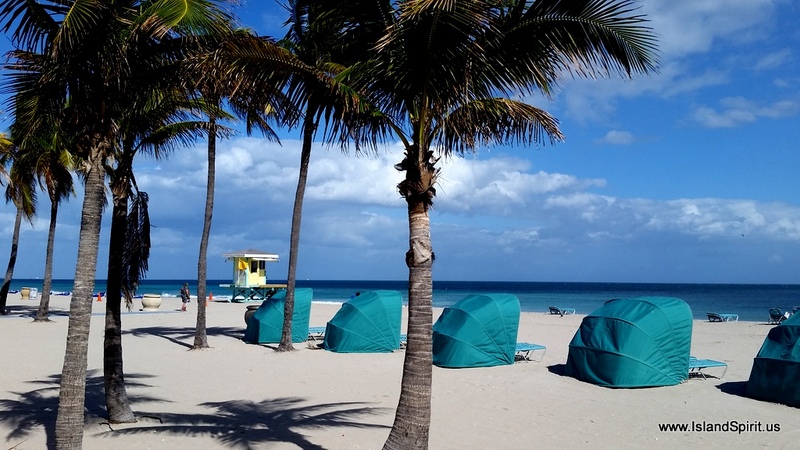 We will move over there Friday, for now, it is a day in Miami Beach. We are running a LIVE tracking map. When the boat moves, this map is updated. Also our blog home page shows our current position. Driving south on the ICW from Lake Worth to Fort Lauderdale takes you past some of the most amazing winter homes on the water you will ever see. Then there are the yachts that are docked in front of these magnificent homes. Yachts like a Pershing 72 which is easily a $2,000,000 yacht look small when compared to the neighbors’ boats. In some cases, the property is enormous because the owner bought two or three lots, tore down the old homes, and then built a massive new mansion. It is really crazy, it is so over the top, yet it keeps getting more and more crazy as you continue into the hub of it all which is the center of Fort Lauderdale near the inlet. 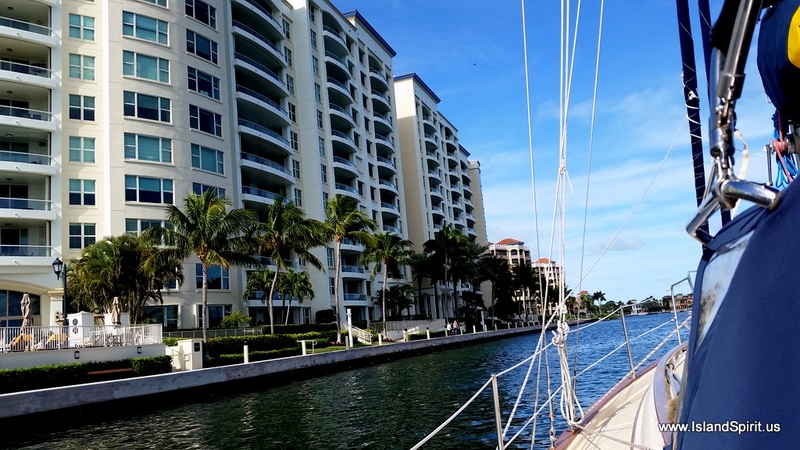 The largest and most expensive homes and yachts are always near the inlets. That way you can easily get your yacht in from the ocean and then dock it safely behind your home. Tomorrow we will make it through this crazy area into Miami and go directly over to South Beach. For now, we are only into day #2 of moving south, and it is just as much fun as it always is! 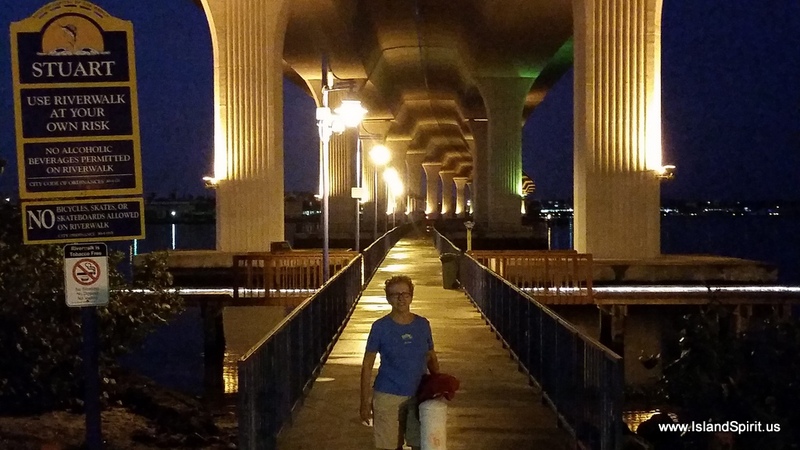 Only half of the Flagler Memorial Bridge can open while a new span is under construction. It only opens once per hour and not during morning and afternoon rush hours, so timing an arrival is critical here. This is a Pershing 72 footer, it is worth $2 million, and it looks small !!!! That is ONE home, and a typical view as you push south. The ICW provides views you can never see from the streets. This is not a row of townhouses. It is one home. 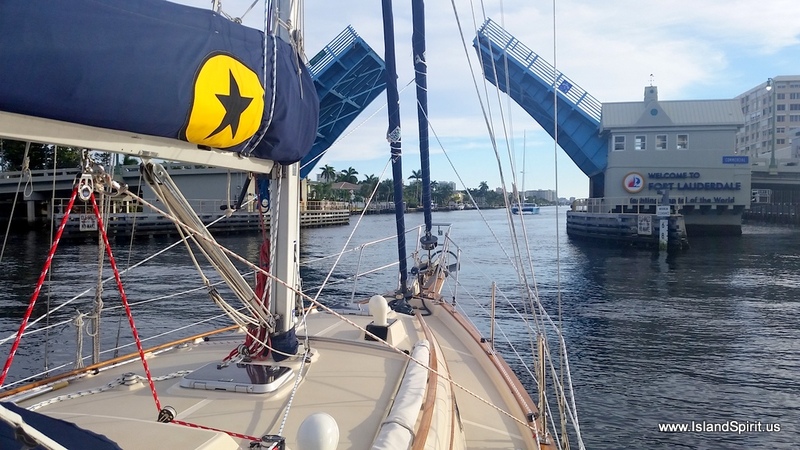 We passed 19 bascule (opening) bridges today. Trying to talk to the bridge tenders and staying in position in the current while waiting with 10 other boats for the bridges to open can be stressful at times! 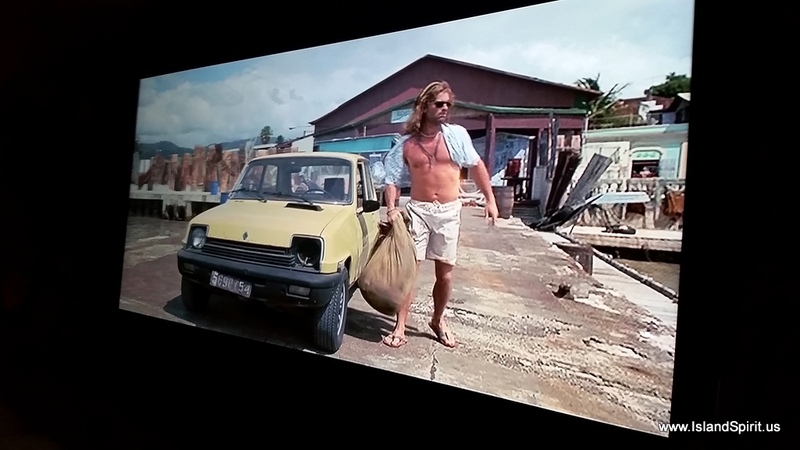 If you import Toyota cars, you get to buy many yachts, this is one of many. Radeen taking the boat through the bridges, it is a worry sometimes. 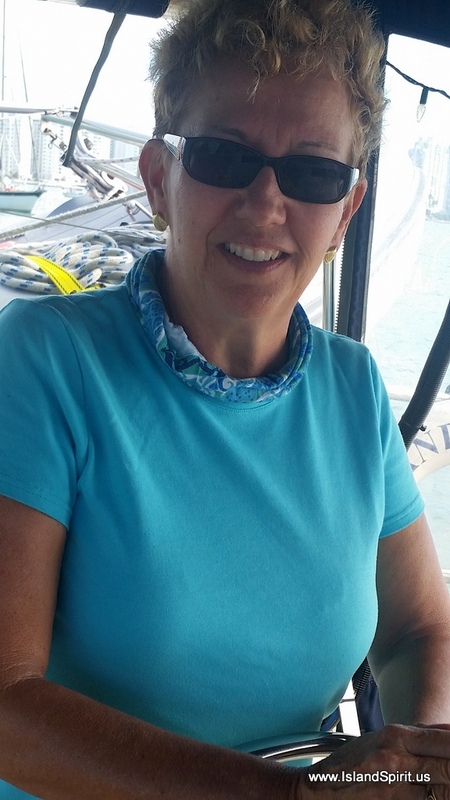 We will soon reach Biscayne Bay where it will be easy and we can sail. 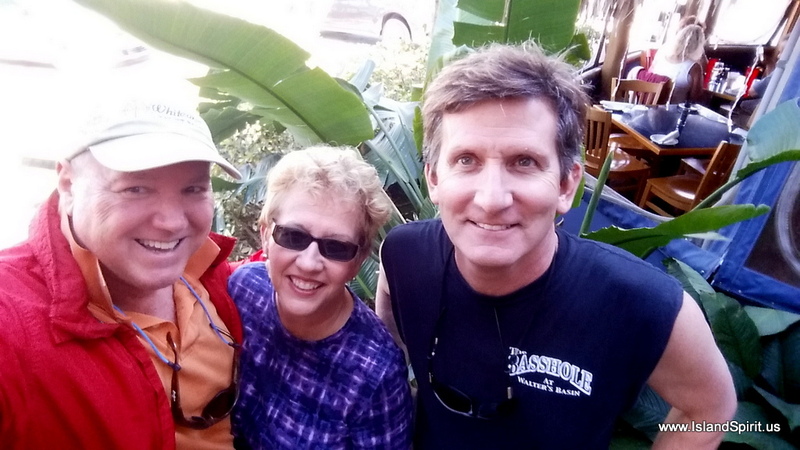 Yes, we will go over to South Beach and, yes, we will run around Coconut Grove and the sailing club. We love Dinner Key area. Right now, we need to finish running one last day of the ICW and get to Miami. This is the most amazing area of the waterway, it is never boring. Thanks for running along with us. 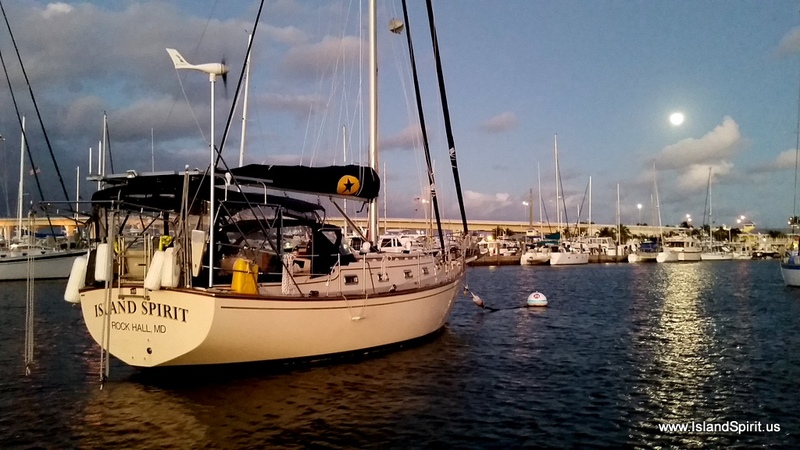 We departed Stuart, Florida, Sunset Bay Marina on Monday, Jan 16, 2017 and headed down the waterway with our first destination of Miami / Biscayne Bay. 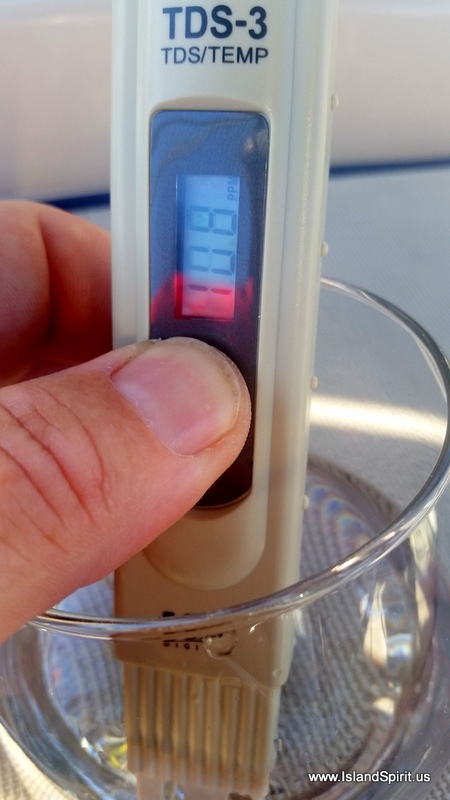 We want to shake down this new gear, and break in our new watermaker and sail. 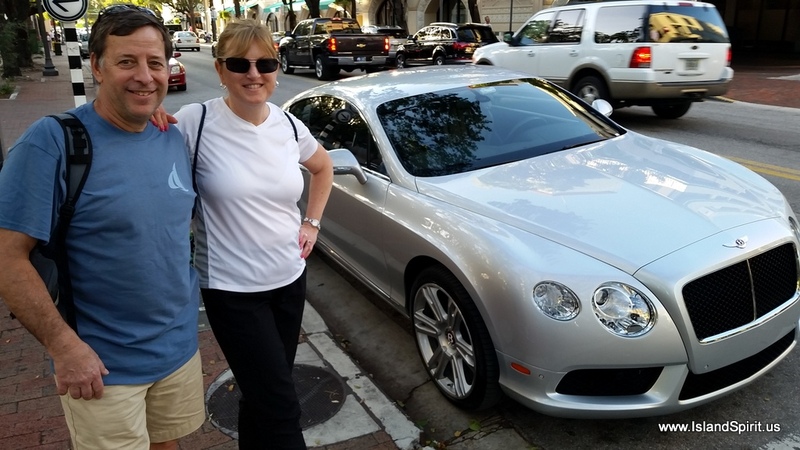 We also have good friends, Fred and Gail arriving on Friday for a nice winter break from the cold north. We plan to attend the Saturday Wallcast in South Beach and then sail south to Boca Chita before the big front arrives Sunday mid day and blows over night. First let’s all remember just how much fun it really is to run the Atlantic Intracoastal Waterway, the A-ICW. Then imagine how crazy it is to run this on a holiday weekend with everyone out and about on every kind of watercraft there is. Oh but wait, let’s add one more a fun activity. The Stuart Boat Show closed at the same time and all the power yachts are running full speed past your beam one boat length away. Yes, welcome to the fun of the Florida ICW. 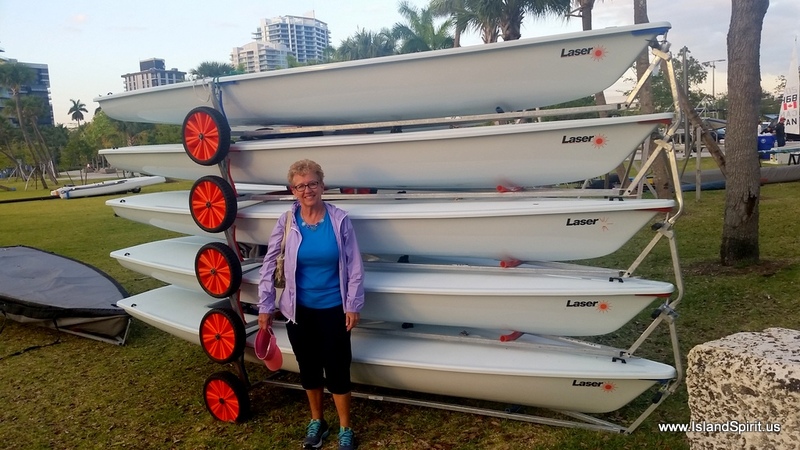 We always say, the people in Florida really enjoy the water, they are out and about on the water more than any other state. We love it here! 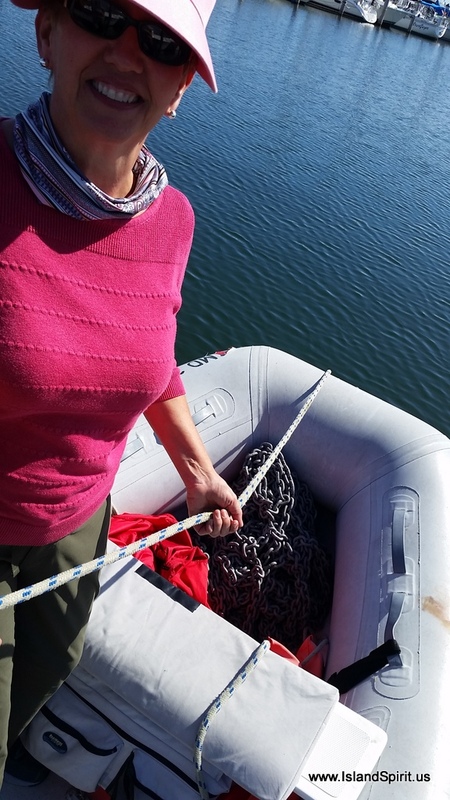 It is great to be moving the boat rather than working on the boat. Island Spirit ran perfectly today. She is a great boat and she loves to run. Let the fun begin again with these few photos…. This should reach 2,000 by May! So here we are anchored out in our first anchorage for the season. 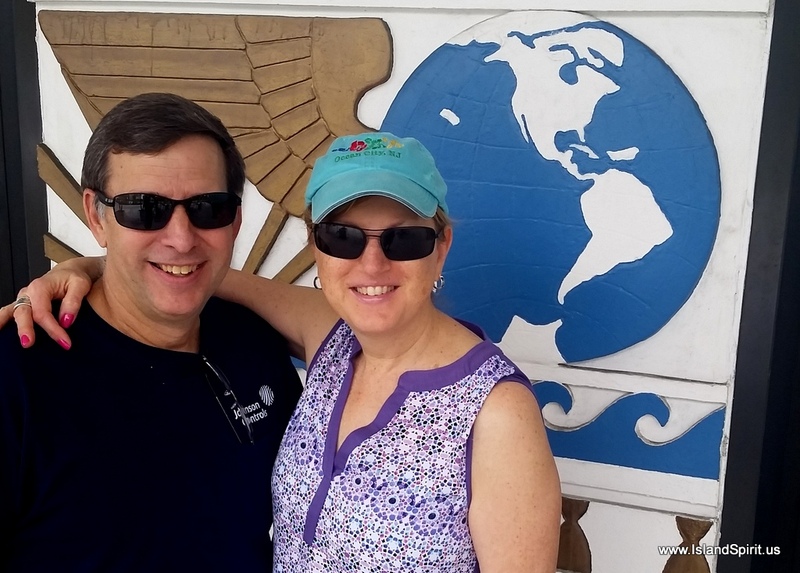 Our cruising friends, Laurie and Jim of IP 350 Kismet, dinghied over to visit. The conversation was lively and the laughs were many, but no photos to prove it. Hope to see you guys again soon in a wonderful Bahamian anchorage! 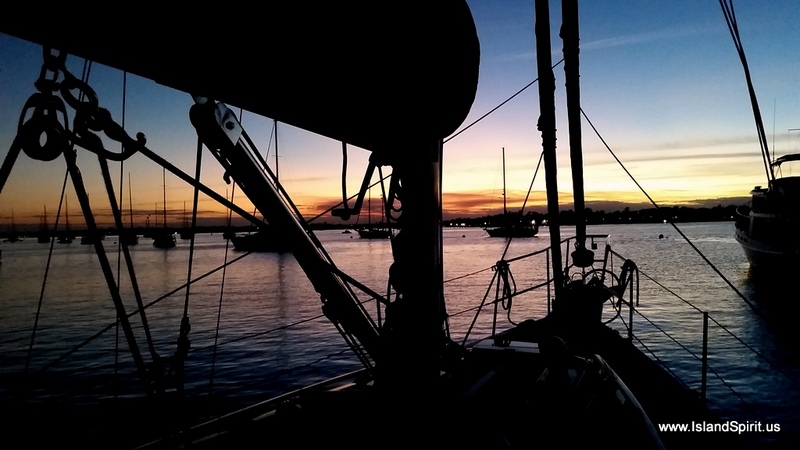 With our New Year’s goals set for our plan of sailing into the Eastern Caribbean, we are now wrapping up our refit time here in Stuart, FL. 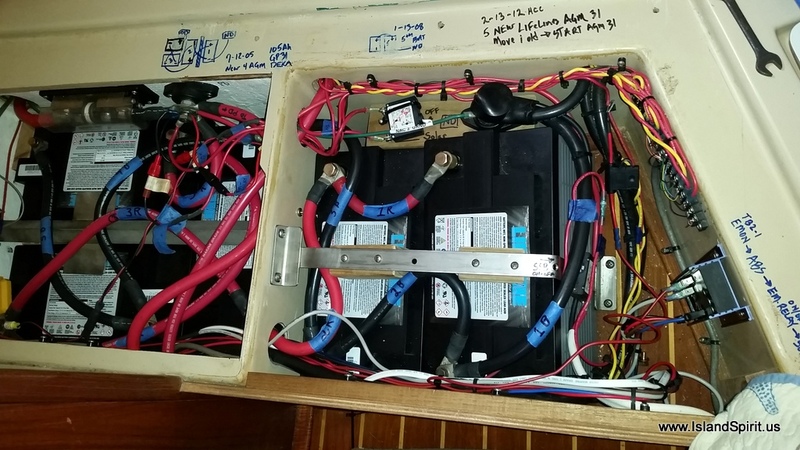 Our days are filled with looking very closely at every system on our boat, every line and every spare part, and then replacing or rebuilding what we think needs to be replaced. 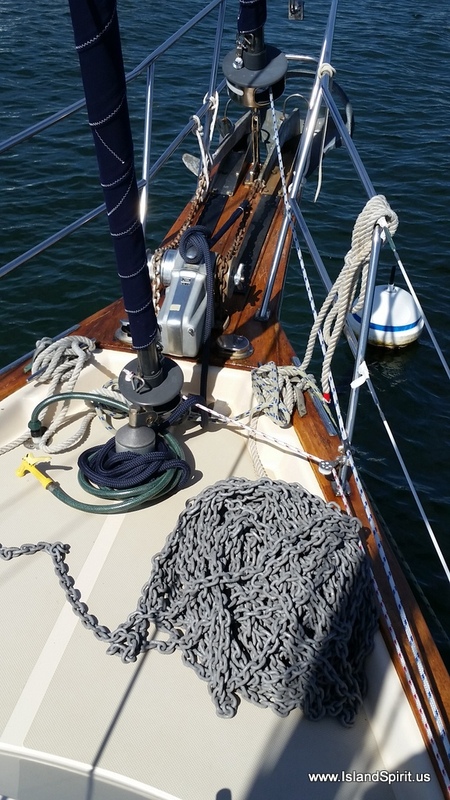 Since January 1, we have replaced all running rigging, halyards, sheets, furling lines, reefing lines, traveler lines and the anchor bridle. 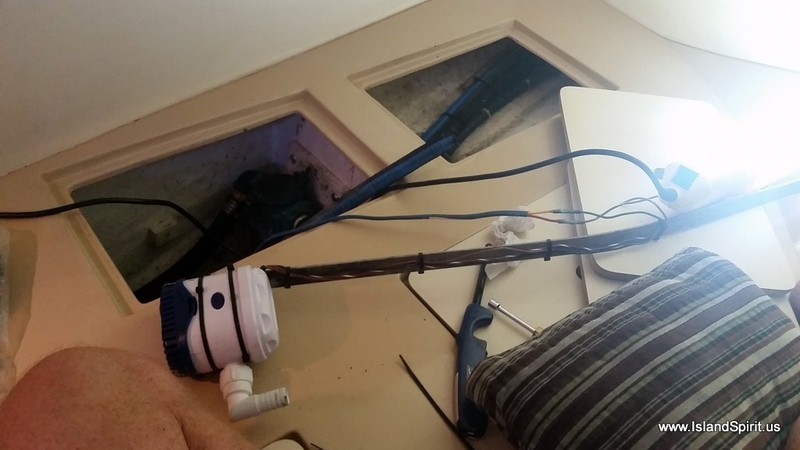 We rebuilt the shower bilge pump and wired it to be controlled by the switch rather than the float switch. 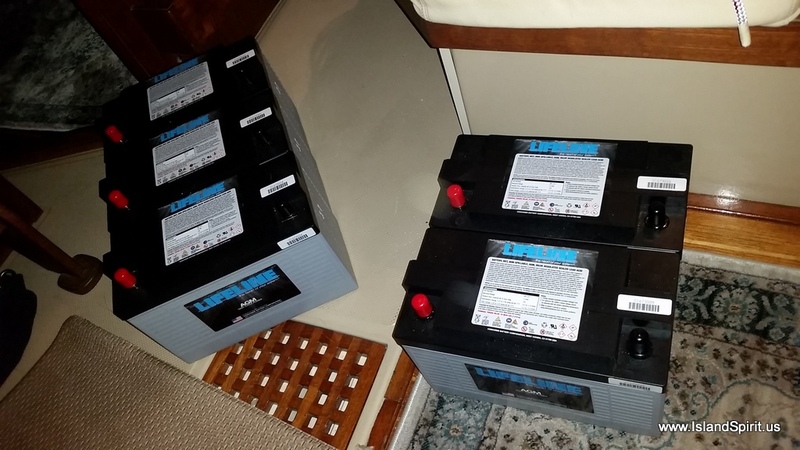 We also installed a new house battery bank of five GPL31t Lifeline AGMs. We changed the oil and the fuel filters and we bought many spares of these along with spare alternator belts. The entire bow is nearly full of spare parts. We think we have enough spares on this boat to almost build another boat! 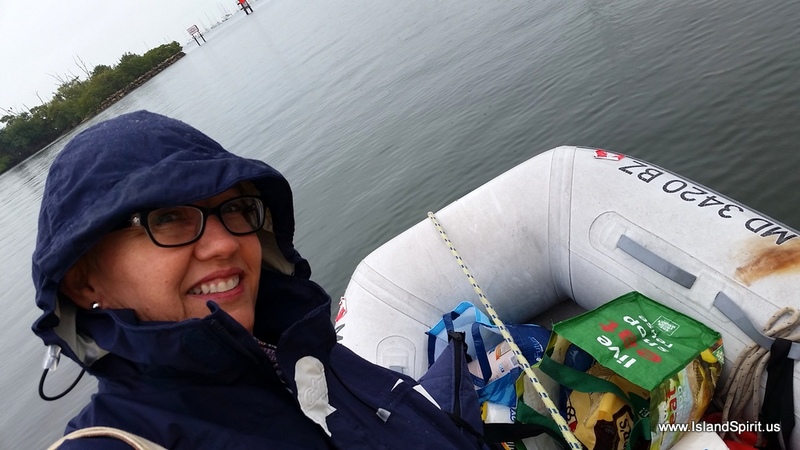 The boat is down to her waterline from the weight of provisions and spares, but when we get out of this nearly fresh water of St. Lucie River and the Okeechobee waterway to real saltwater, we think we will float a bit higher. We hope! 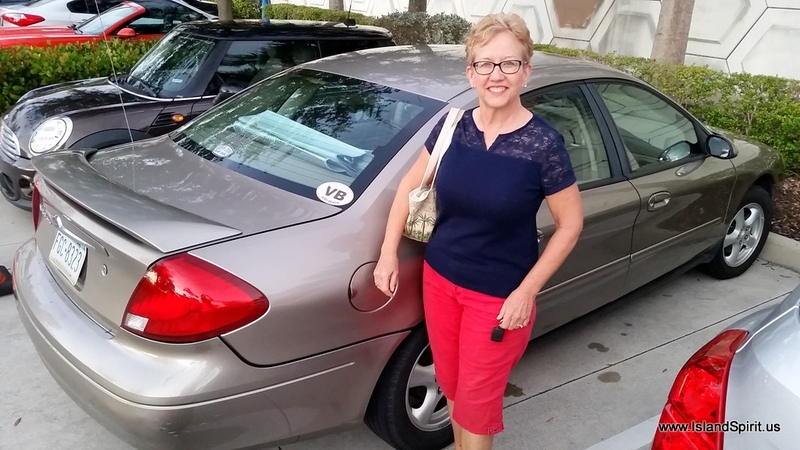 We sold our car to good friend, Terri of IP38 Sailbatical, for her son to use at college. “Goldie,” our 2003 Ford Taurus had 4,000 miles on her when we bought her. She is a great car and we know she will enjoy going back to college again. Drexel then, UCF now! 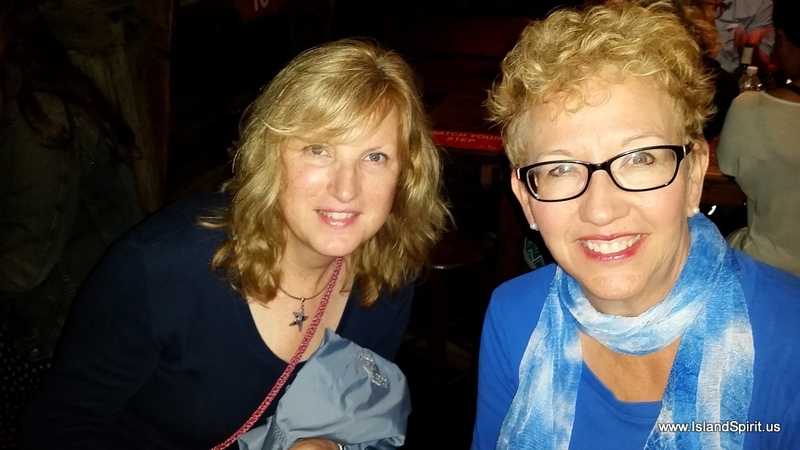 We will enjoy one more very fun event before leaving the Treasure Coast. Our dear friend Carey, formerly SP Cruiser Catspaw, is getting married on the beach in Vero this weekend. 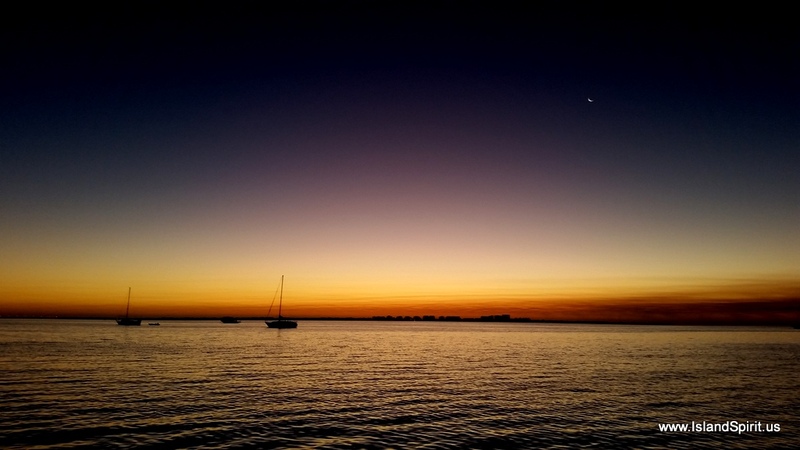 After this big event, we plan to sail out to Biscayne Bay where we will break in the watermaker and shake down all this new gear while sailing as much as we can. 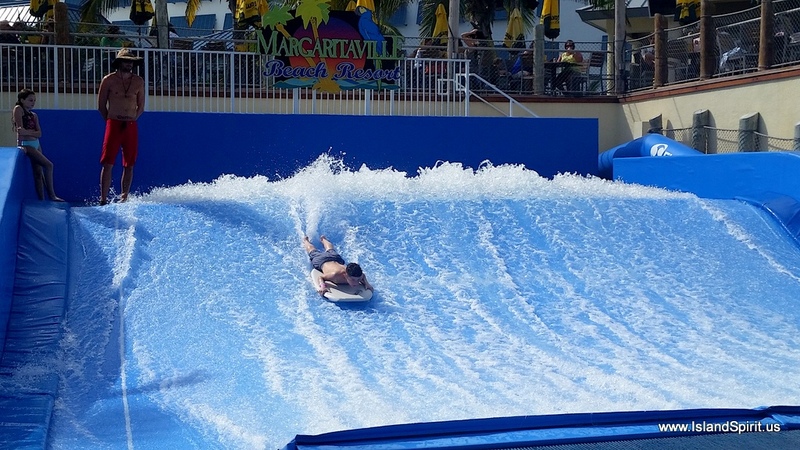 Our weather expert, Chris Parker, sees no opportunity to go east into the Bahamas for a week or two or more. The easterly trade winds are just non-stop. 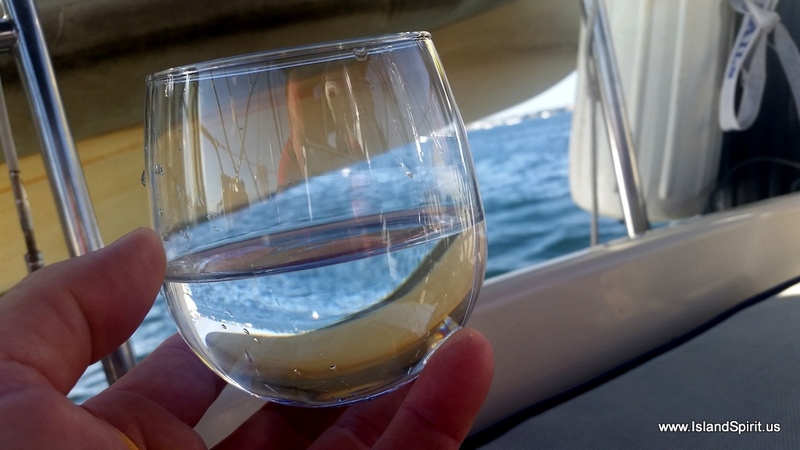 That is OK, we can happily sail Biscayne Bay for weeks. Just fine with us. 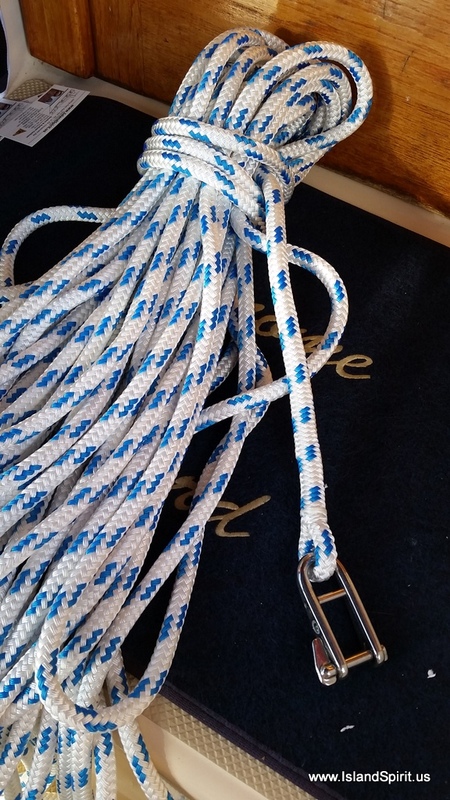 Beautiful splice, thank you Mack Sails! Radeen sells her car to a good friend. Now “Goldie” goes to college in Orlando. 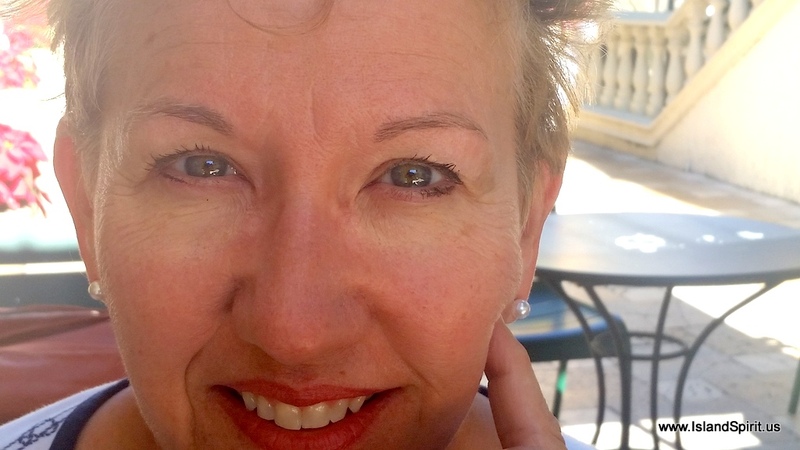 I know we have not been blogging much, but we will soon pick up the pace as we set sail. I would rather post about sailing than working on the boat. That makes for better photos and better stories. I will say, this has been a long 2 months of work that we really thought we would do in 3 weeks. 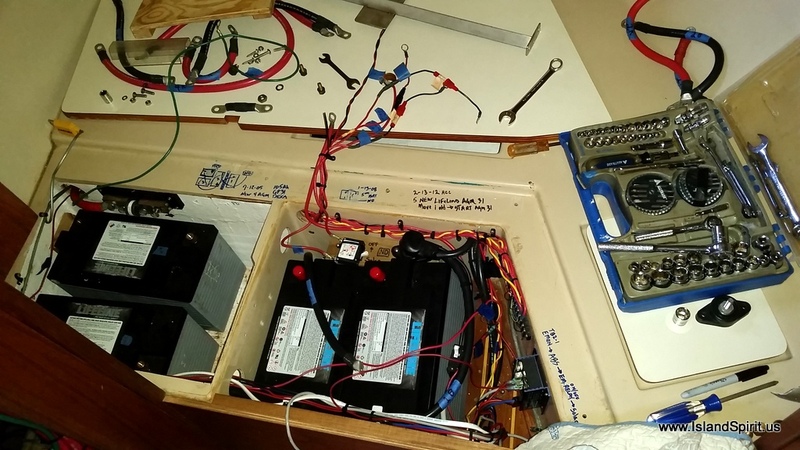 Well, we did expand on our original tasks of a replacement radar and adding a watermaker….afterall, this IS a boat! Setting our goals for 2017. 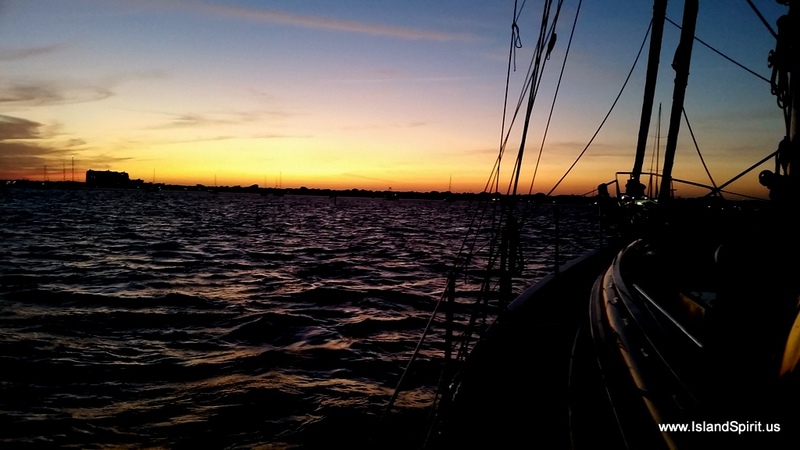 Thank you all for sharing in our sailing and cruising goals. It is great to share this with everyone.